A new report prepared by NASA for the Department of Water Resources (DWR) shows that increased groundwater pumping in the San Joaquin Valley has caused widespread land subsidence. Some areas have been sinking nearly two inches per month. Subsidence can damage nearby infrastructure and permanently reduce the aquifer’s water storage capacity. 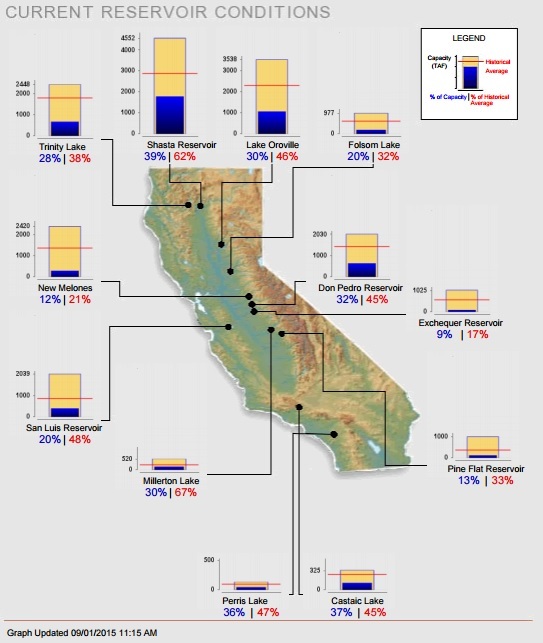 DWR also released a draft list of Critically Overdrafted Groundwater Basins. According to the Sustainable Groundwater Management Act of 2014, DWR must identify high and medium groundwater basins and subbasins that are in conditions of critical overdraft. These basins must be managed under a groundwater sustainability plan by January 31, 2020; all other high and medium priority basins have until 2022. As of August 19, approximately 2,225 wells statewide have been identified as critical or dry, which affects an estimated 9,488 residents. The vast majority of these wells are in the Central Valley. -The Bureau of Reclamation will begin releasing water from Lewiston Dam on the Trinity River, the Klamath River’s primary tributary, in order to protect salmon fisheries. -The Bureau will also cut flows from Folsom Dam in half in order to conserve water. 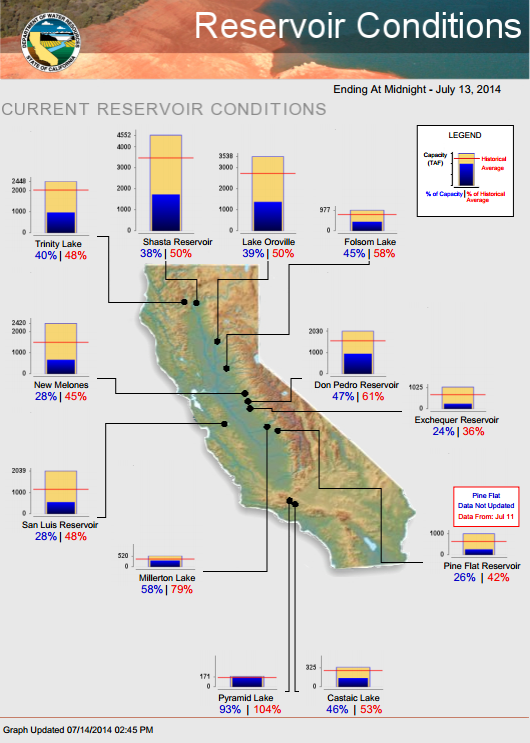 Folsom Reservoir is currently at 20% of capacity and about 75,000 acre-feet away from dead-pool, where the lake levels will be too low to continue pumping. –Statewide water use in July was down 31% this year from 2013. 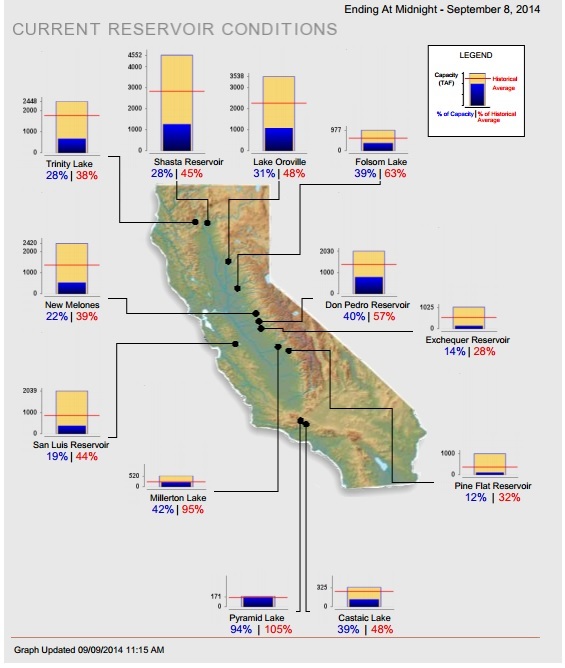 Statewide, California’s major reservoirs (representing 27.3 million acre-feet of storage) are at 30% of capacity and 49% of group average. 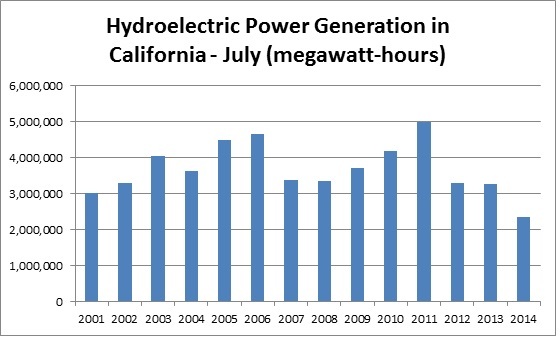 Hydroelectric power generation in June this year was 31% lower than 2014 and 60% lower than the 2003-2013 average. 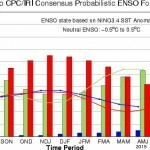 The National Weather Service’s Climate Prediction Center now says that there is a greater than 90% chance that El Niño will continue through Northern Hemisphere winter 2015-16, and around an 85% chance it will last into early spring 2016. The most powerful El Niño on record was in 1997, which doubled the annual rainfall to Southern California and doubled the snowpack in the Sierra Nevada. However, storms also resulted in punishing floods and mudslides. The current signal in the ocean is stronger now than it was in 1997, according to NASA climatologist Bill Patzert. However, California’s unhatched chickens must not yet be counted. A strong El Niño is going to require a major collapse of the trade winds that could otherwise block El Niño’s storms from reaching California. In addition, a mass of warm water (dubbed “the blob”) in the Pacific Ocean might also dampen the impact of an El Niño. 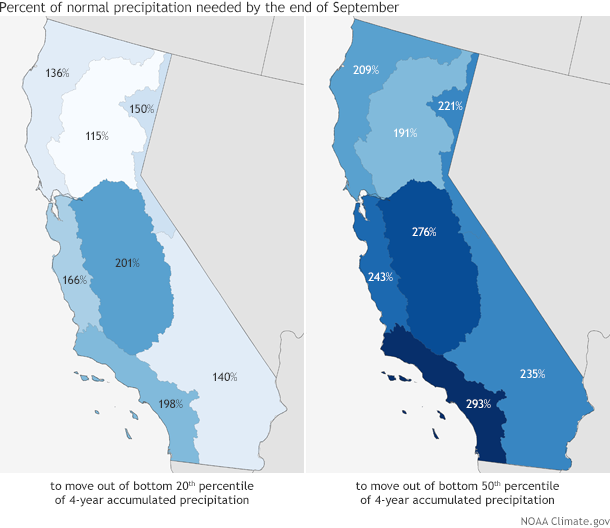 Should higher temperatures cause precipitation to fall in the form of rain rather than snow, California water managers might not be able to capture and store all of it. And even if the “Godzilla” El Niño does develop, California will still have massive water deficits that will be exacerbated if drought conditions continue in the years to come. -On July 31st, Governor Brown declared a state of emergency in California to help mobilize additional firefighting and disaster response resources. -The Forest Service released a report that shows firefighting now consumes more than half of the agency’s annual budget, up from 16% in 1995. Bills are now moving through congress to try to address this issue. -The Los Angeles Department of Water and Power has released 96 million “shade balls” into the Los Angeles Reservoir in order to prevent evaporation and protect water quality. -AT&T announced a special offer to help California customers detect water leaks in their homes. As part of the program, AT&T will also make contributions to The Nature Conservancy to help protect California’s water resources. 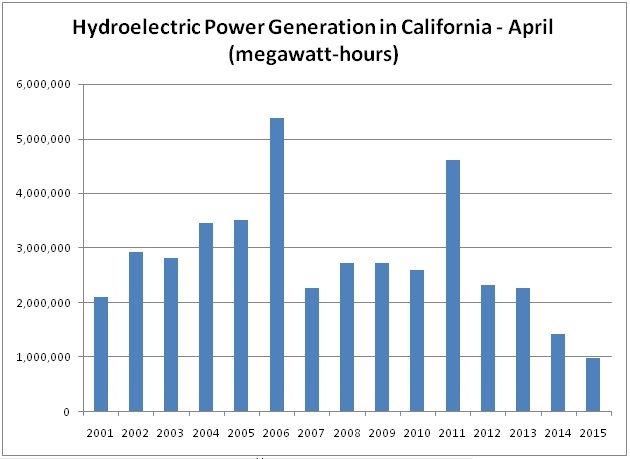 -The California Energy Commission voted to increase water efficiency standards for showerheads and moved up the implementation date for recently-adopted standards for lavatory faucets. Drought conditions remain mostly unchanged (excepting a slight decline in the percent of the state in “severe drought”) from two weeks ago. 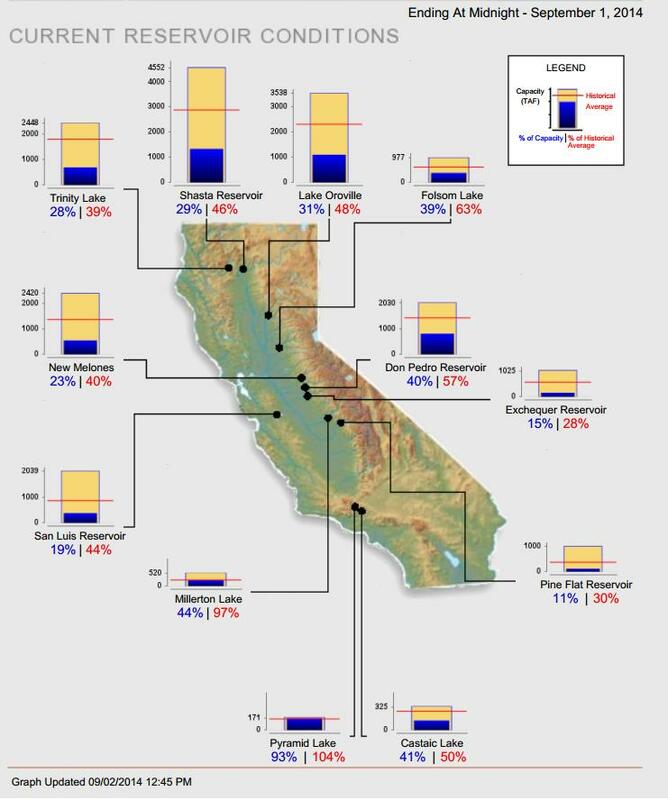 Statewide, California’s major reservoirs (representing 27.3 million acre-feet of storage) are at 32% of capacity and 49% of group average. -Healdsburg is giving away recycled wastewater for free, to be used on vegetable gardens and ornamental landscaping. -A new NASA study shows that, since 2012, California has accumulated a precipitation debt of about 20 inches — the average amount of annual statewide precipitation. 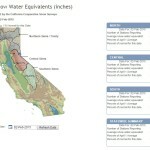 -The state’s new “SaveWater” website is up, which allows users to report water waste in their communities. –Statewide water use in June was down 27% this year from 2013. 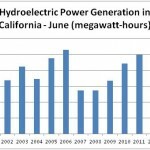 –A new report from UCLA’s Institute of the Environment and Sustainability concludes that there’s no way to know how much water in California is lost to leakage and breaks, largely because the state does not require monitoring and utilities do not sufficiently invest in systems to track leaks and breaks. Several bills are making their way through the halls of Congress right now. Together, these bills give a good indication of how the Federal government is thinking about their role in finding solutions to the drought. –H.R. 2898: Western Water and American Food Security Act of 2015, introduced by David Valadao, passed in the house and is on its way to the Senate, where it is not expected to pass (and Obama has indicated he would veto the bill). 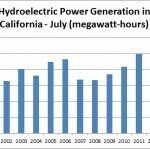 The bill would increase pumping from the Delta, alter the Bureau of Reclamation’s decision-making process for the operation of the Central Valley Project, end a salmon restoration program in the San Joaquin River, and fast-track feasibility studies for building or enlarging five dams in the state. –H.R. 2983: Drought Recovery and Resilience Act of 2015, introduced by Representative Jared Huffman, was referred to committee on July 8th. The bill would provide emergency funding to improve water supply and reliability, help out-of-work farmworkers, and combat upstream water theft on federal lands. –H.R. 2993: Water Recycling Acceleration Act of 2015 was also was assigned to a congressional committee this month. The bill, introduced by Representative Doris Matsui, would amend the Reclamation Wastewater and Groundwater Study and Facilities Act to authorize funding for water recycling projects in states with drought declarations, without congressional approval. –H.R. 3045: California Water Recycling and Drought Relief Act, introduced by Representative Jerry McNerney will, like HR 2993, amend the Reclamation Wastewater and Groundwater Study and Facilities Act to authorize 27 regional water recycling projects that would provide over 100,000 acre-feet of new water. -The U.S. 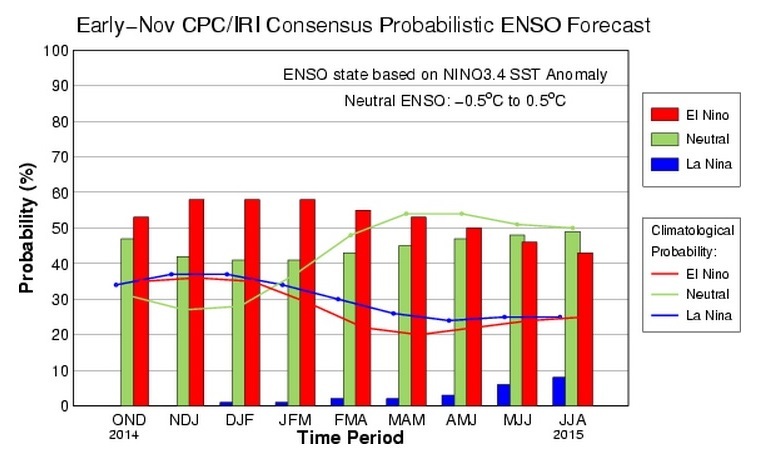 Climate Prediction Center is forecasting a greater than 90% chance that El Niño will continue through Northern Hemisphere winter 2015-16, and around an 80% chance it will last into early spring 2016. –A judge ruled that notices to some farmers from the State Water Resources Control Board violated their rights by telling them to stop diverting water. The judge issued a temporary restraining order, blocking the Board from punishing those in violation of the notices, although the Board can still punish those who divert water illegally. -The State Board responded by issuing a $1.5 million fine to the Byron-Bethany Irrigation District. -Governor Brown signed a bill that would prevent local governments from issuing fines for brown lawns during drought emergencies. -The Department of Water Resources has updated the State Model Water Efficient Landscape Ordinance, as required by the Governor’s Executive Order in April. 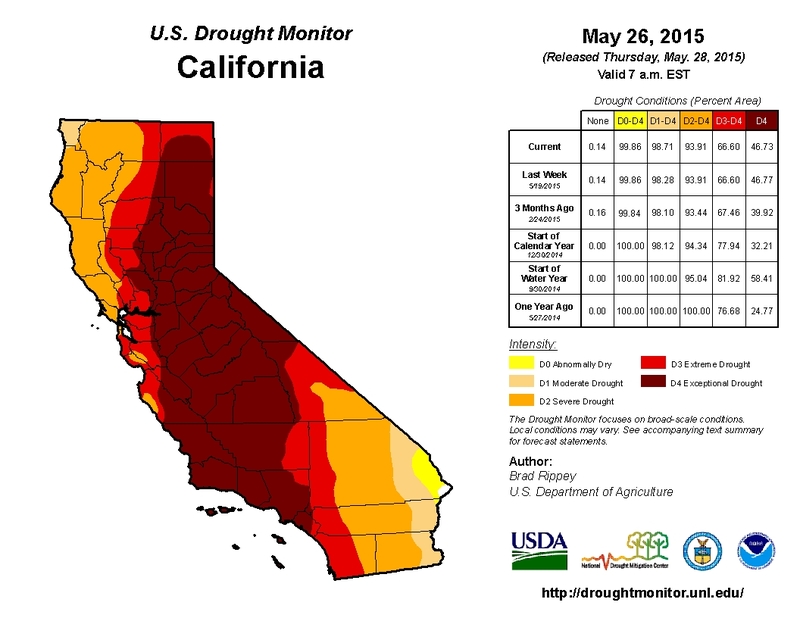 Drought conditions remain effectively unchanged from two weeks ago. 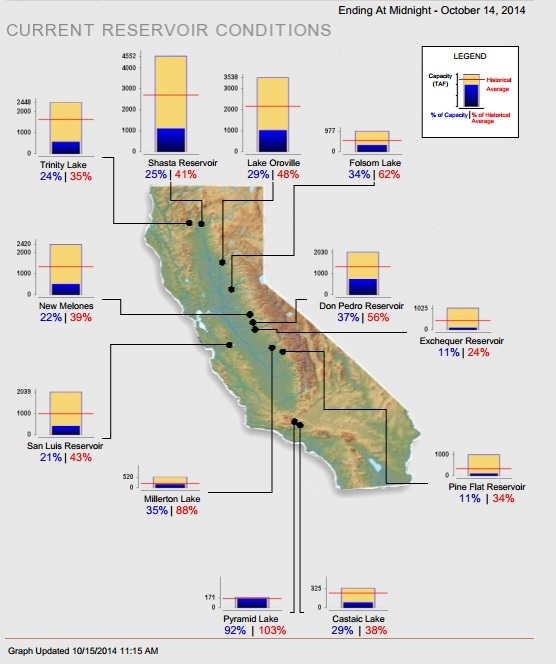 Statewide, California’s major reservoirs (representing 27.3 million acre-feet of storage) are at 36% of capacity and 50% of group average. New data released by the State Water Resources Control Board show residential users have reduced May water use in 2015 by 28.9% from May 2013. 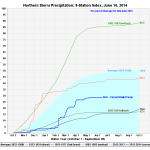 However, the Board notes that, statewide, May 2015 was cooler and wetter than May 2013. The Board will begin issuing enforcement actions in July against suppliers that don’t reduce their required amount. The Pacific Institute has created an interactive table and map to help readers explore and visualize these data. 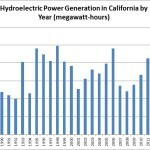 -The State Board issued curtailment orders to senior water rights dating back to 1858 on the Merced River and to all pre-1914 appropriative rights on the on the Upper San Joaquin River watersheds. The Board also issued a curtailment notice to the City of San Francisco for four appropriative water rights it holds on the Tuolumne River dating back to 1903. 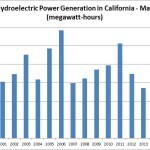 -For the first time in history, the Delta Mendota Canal is now running backwards, pumping water from San Luis Reservoir to upstream water districts in the western San Joaquin as well as the City of Tracy. -Over the course of two weeks, the Lake Fire burned more than 30,000 acres of land in San Bernardino County. This was the largest wildfire of the year and the first in recorded history in that area. 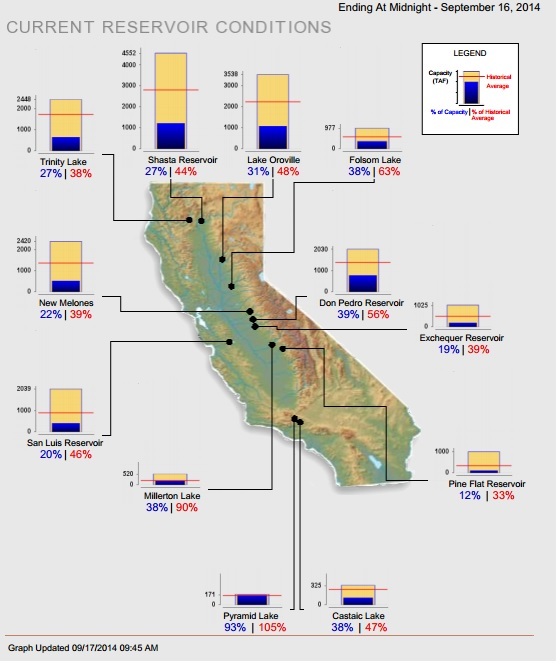 Statewide, California’s major reservoirs (representing 27.3 million acre-feet of storage) are at 38% of capacity and 51% of group average. 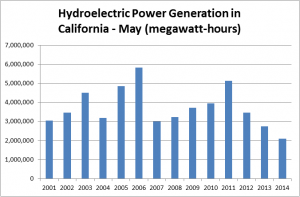 Hydroelectric power generation in April this year was 31% lower than 2014 and 69% lower than the 2003-2013 average. -So far, 31% of water rights holders who were issued curtailment notices (representing 78% of the total curtailed water demand) have submitted compliance notices to the State Water Resources Control Board. -The Marin Municipal Water District is being sued for its tiered rate structure, while the California attorney general’s office has asked the state Supreme Court to depublish a ruling that found the city of San Juan Capistrano’s rate structure to be unconstitutional. The Attorney general’s office claims the opinion is “likely to create confusion and uncertainty”. -The Department of Water Resources has issued proposed revisions to the Model Water Efficient Landscape Ordinance. The revisions would ban grass in medians, prohibit the installation of non-functional turf in new construction, and require the installation of specific, more water efficient irrigation systems for landscapes. The revisions also reduce the size threshold (the square footage above which projects are subject to the ordinance) for all new constructions projects from 2500 sq. ft. to 500 sq. ft. The state’s mandatory water cutback went into effect on June 1st. Communities are being asked to reduce anywhere from 8% to 36% of their 2013 residential per capita water use, for an overall statewide reduction of 25%. Failure to meet these targets could result in a fine of up to $10,000 a day. Just after these reductions went into effect, the State Water Resources Control Board released new water supplier conservation tiers for California water agencies. 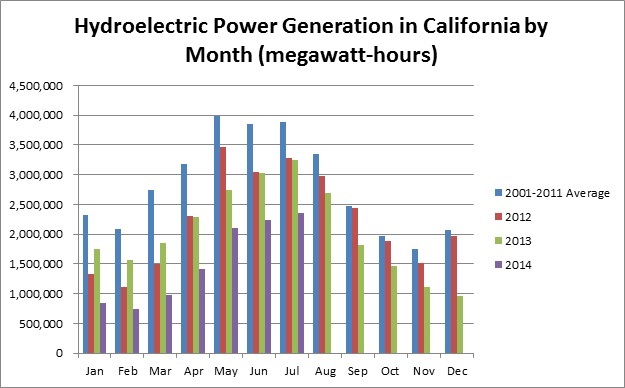 These tiers indicate how much each utility is required to conserve, relative 2013 use data. As a result of new information submitted by utilities, 22 tiers have been updated, with 36 requests for updates still pending. So far, the number of suppliers who must reduce water use by 36% has decreased from 86 to 67. 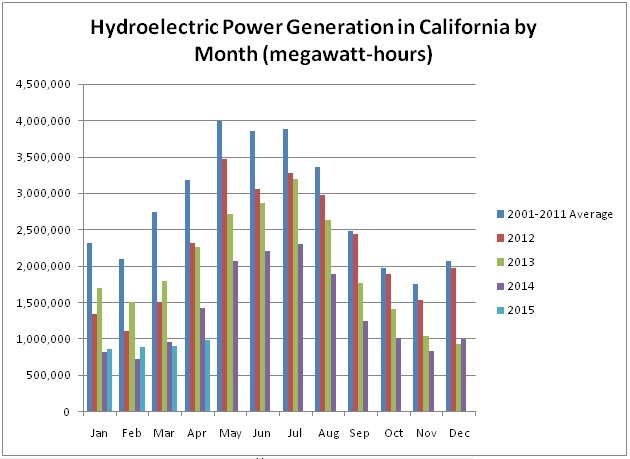 The State Board data show residential users have reduced April water use in 2015 by 13.5% compared to April 2013. The Pacific Institute has created an interactive table and map to help readers explore and visualize these data. -The California Sportfishing Protection Association, Restore the Delta, California Water Impact Network and AquAlliance filed a lawsuit against the U.S. Department of Interior, Bureau of Reclamation, the California State Water Resources Control Board and Department of Water Resources, claiming the groups violated the federal Clean Water Act, the Bay Delta Plan, and other laws. -The U.S. Senate Committee on Energy and Natural Resources held a hearing on the status of drought conditions in the western U.S.
-The State Board has reduced flows from Lake Shasta in order to protect endangered salmon. Drought conditions remain unchanged from two weeks ago, except in one category, where 69.6% of the state is now considered to be in “extreme drought”, up from 66.6% last week. 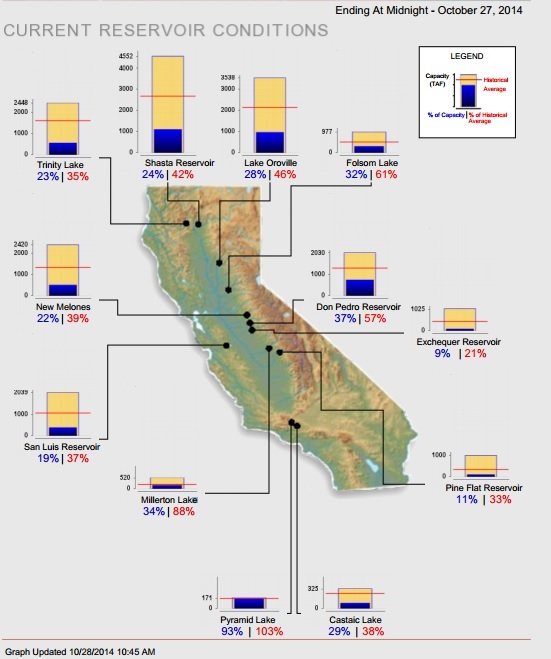 Statewide, California’s major reservoirs (representing 27.3 million acre-feet of storage) are at 42% of capacity and 54% of group average. -Wildfire season officially began earlier this month. Since the beginning of 2015, California Department of Forestry and Fire Protection (CAL FIRE), has responded to over 1,406 wildfires across the state, up from a five-year average of 854. These fires have burned more than 6,000 acres, up a five-year average of 5,475 acres. This is a low estimate of the true fire damage in the state, as these numbers do not include fires outside of CAL FIRE’s jurisdiction. 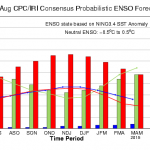 -The International Research Institute for Climate and Society has increased the probability of El Niño weather conditions to more than 90% through August, up from April’s forecast that estimated a probability around 70% through July. Still, this does not necessarily spell drought relief for California. Last week, the State Water Resources Control Board issued the first mandatory water restrictions in the state’s history. The rules, which take effect June 1st, will be in place until February 2016. Under the new restrictions, every water service provider with more than 3,000 connections must conserve a specific percentage of their 2014 per capita use. Percentages range from 8 to 36 percent. 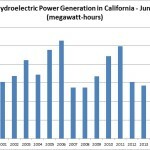 Any utility not meeting its target faces fines up to $10,000 per day. 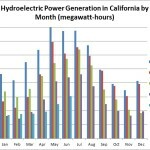 On May 1st, the State Board issued curtailment orders to junior water rights holders in the Sacramento River watershed, adding to the curtailment orders that have already been issued for junior water rights holders in the San Joaquin River, Scott River, Antelope Creek, and Deer Creek watersheds. This Monday, the State Water Resources Control Board announced it would soon be issuing curtailment orders to users with the most senior water rights. 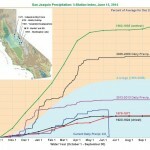 –San Jose Water Company will begin imposing mandatory water rationing next month, making San Jose the largest California city to impose rationing. -The state has started building an emergency salinity barrier in the Sacramento-San Joaquin Bay Delta. The barrier is intended to prevent saltwater intrusion and protect the quality of water pumped from the Delta for irrigation and urban use. -The U.S. Forest Service estimates the drought has killed at least 12 million trees in California’s national forests, which are already at an elevated risk from wildfires. Despite unseasonable snow and rainfall last week, average precipitation for the water year (which begins October 1st) is still at or below normal for most of the state. Statewide, California’s major reservoirs (representing 27.3 million acre-feet of storage) are at 45% of capacity and 58% of group average. 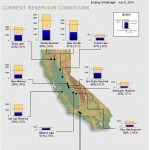 Following severe drought conditions and the lowest early-April snowpack record in 75 years, Governor Brown issued the first-ever statewide mandatory water reductions on April 1, 2015. Executive Order B-29-15 calls for cities and towns throughout the state to reduce water use by 25 percent compared to the 2013 level, potentially resulting in a 1.3 million acre-feet of water in savings. The Order also requires frequent water use reporting from agricultural water users; updates standards for toilets, faucets, and outdoor landscaping; streamlines drought response; and necessitates investments in innovative water management technologies. -On April 3, 2015, The State Water Board issued its first Curtailment Order this year to limit diversions from Antelope Creek Tributary in Tehama County to maintain minimum environmental flows for salmon and steelhead migration. -East Bay Municipal Utilities District (EBMUD), supplier of potable water to 1.3 million customers in Alameda and Contra Costa counties, declared a Stage 4 drought emergency – the highest level it can adopt. The District has adopted mandatory outdoor water rules and will consider adopting new water rates in June. –DWR plans to install a drought barrier on West False River in May to prevent rising salinity level in the central Delta. This action will protect a large portion of the state’s freshwater supplies. -Tomorrow, the State Water Board will release a draft of the proposed Emergency Water Conservation for an informal public comment. The Regulation is expected to be adopted on May 5 or 6, 2015 following public comment and a formal notice. -DWR released the first two chapters of California’s Groundwater Update 2013– compiling statewide groundwater findings, data gaps, and recommendations. Chapters broken down by hydrological region will be released each month over the next few months. Drought conditions have slightly worsened from two weeks ago, with 44% of the state now in “exceptional drought.” This is an increase from 41% at the end of March. 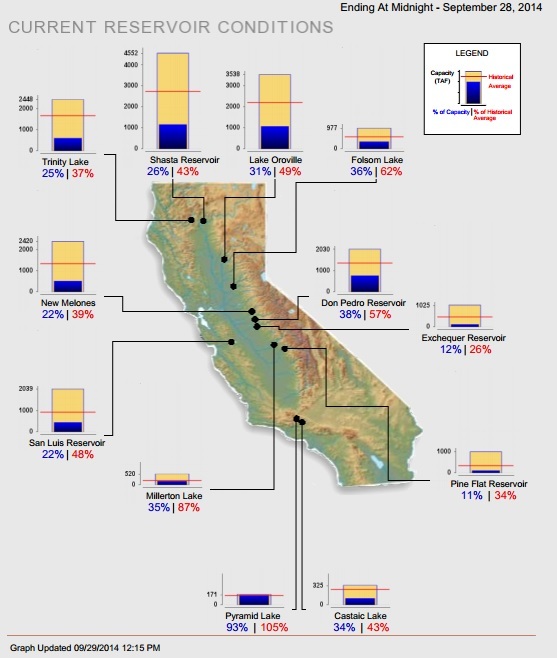 Statewide, California’s major reservoirs (representing 27.3 million acre-feet of storage) are at 40% of capacity and 62% of group average. -The Association of California Water Agencies in partnership with the statewide conservation education program Save Our Water conducted a statewide poll showing that a vast majority of California residents believe it is important to conserve water, regardless of drought conditions, and are willing to make significant changes to their own usage in order to conserve water. –Another poll, conducted by the Public Policy Institute of California, found that Californians are worried about their water supply and that people in their region are not doing enough in response to the drought. 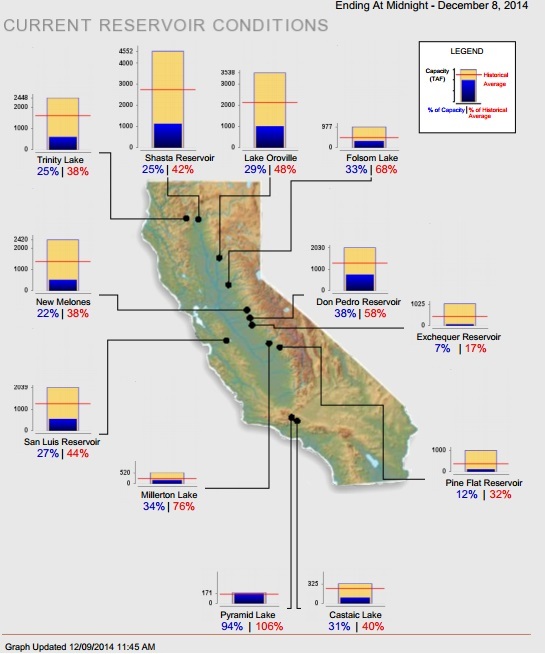 -The California Department of Water Resources (DWR) published a report comparing the hydrology and impacts of the current drought to the state’s most significant historical droughts. -Tomorrow, DWR will release the results of the year’s fourth manual snow survey. 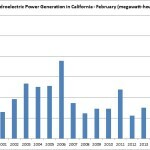 Electronic surveys show that the snowpack is at 8% of the historical average for late March. -an order for water suppliers with 3,000 or more service connections to provide monthly data on water production, compliance actions, and outdoor water conservation measures being implemented. Two weeks ago, the State Board released urban water use data for January 2015, which shows that water use in January fell nearly 9% in 2015 from 2014. –New Research in the journal of the Proceedings of the National Academy of Sciences suggests that warm temperatures combined with low precipitation increases the probability of drought in California. The report also shows that climate change further increases the probability of drought as a result of warmer weather conditions. -The National Oceanic and Atmospheric Administration announced the development of an El Niño, an ocean-atmospheric phenomenon characterized by warmer-than-average sea surface temperatures in the central Pacific Ocean. However, scientists predict the El Nino will be weak and will not result in impacts to global weather conditions. -The Department of Water Resources conducted this season’s third manual snow survey. On March 3rd, snowpack was 19% of average for this date, the second lowest recorded snowpack in March. 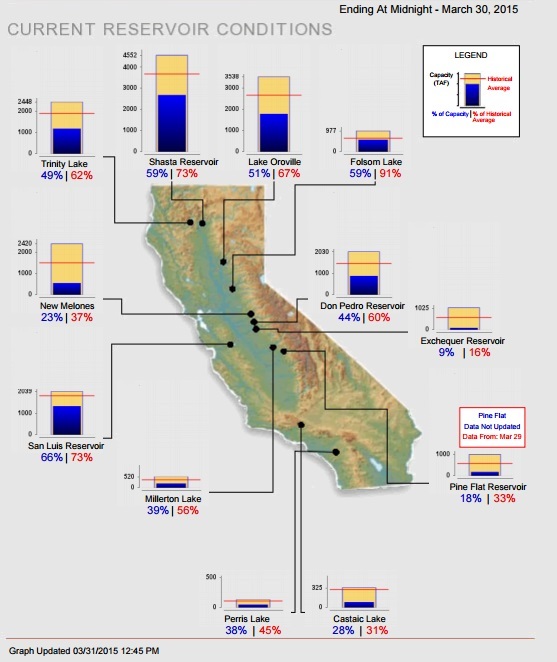 Statewide, California’s major reservoirs (representing 27.3 million acre-feet of storage) are at 46% of capacity and 67% of average. 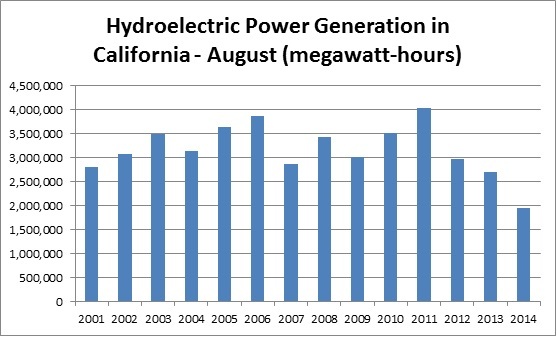 Hydroelectric power generation in December 2014 was 7% higher than 2013, but 52% less than the 2000-2012 average. 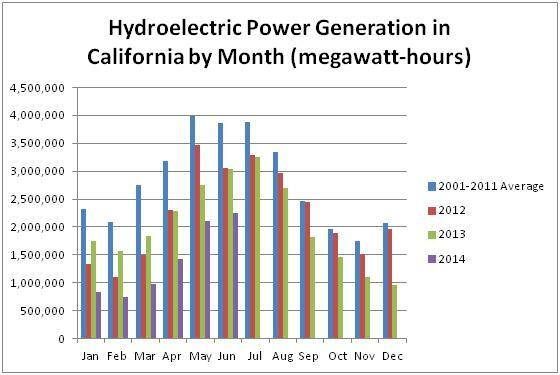 For the 2014 calendar year, hydroelectric power generation was 31% less than last year. -The California Department of Fish and Wildlife presented promising salmon run forecasts for the coming season. 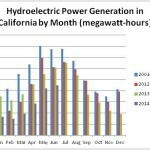 -In addition, the East Bay Municipal Utility District reported that 12,118 salmon returned to the river last fall, making last year’s run the fifth-highest in 74 years. -And the Pacific Fisheries Management Council released 2014 stock assessments for the Klamath River that were higher than predicted. The Act will also provide $5 million to agricultural water use efficiency projects within the Central Valley Project. The Bureau also published a new report as part of the West-wide Climate Risk Assessments (WWCRA), which aims to project future changes in water supplies, water demands, and river system operations that could result from changes in climate. The new report projects irrigation demand in eight major river basins in the West and reservoir evaporation for 12 reservoirs within those river basins. The basins include the Central Valley in California, as well as three others shared with neighboring states: the Klamath, Colorado, and Truckee and Carson River Basins. The report found (among other things) that reference evapotranspiration is projected to increase in all basins by up to about 15%. You can read the report and other results from this study and other WWCRA studies here. –A new study in the journal Science Advances shows there is at least an 80% chance of a 35-year-long drought occurring by the end of this century. -The Legislative Analyst’s Office released a report outlining recommendations to the legislature for effective implementation of Proposition 1, the water bond measure that was approved by voters in November. 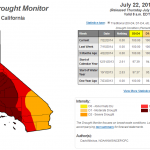 -The Metropolitan Water District of Southern California will consider water rationing beginning July 1st, if drought conditions do not improve. Drought conditions in the “extreme drought” category have improved this week, down to 67% from 77% last week. 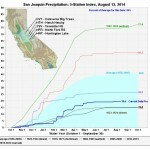 A large storm brought much-needed rain to northern California early this month. Still, average precipitation for the water year (which begins October 1st) is still at or below normal for much of the state. Statewide, California’s major reservoirs (representing 27.3 million acre-feet of storage) are at 44% of capacity and 68% of average. -The Department of Water Resources submitted an application to the US Army Corps of Engineers to install a salinity barrier in the delta if drought conditions continue. The department installed such a barrier during the 1976/1977 drought and had plans in place last year to construct salinity barriers, although these proved unnecessary following late season precipitation. -The State Water Resources Control Board issued a notice to water rights holders that their allocations may again be curtailed this year. The Board also issued a review of its water rights implementation system; the report focuses on recommendations to improve data collection, analysis, and reporting. -The Department of Water Resources has conducted the second manual snow survey of the year, finding a “dismally meager snowpack for a drought-stricken state.” Snow water equivalent in the state is 22% of normal for this time of year, down from 36% two weeks ago. –NOAA satellite images show a greener northern California with visibly less snowpack than previous years. The California Department of Fish and Wildlife (CDFW) has released results from the annual Fall Midwater Trawl (FMWT) Survey of the Sacramento-San Joaquin Delta. CDFW has conducted the monthly trawl survey between September and December since 1967 (except for 1974 and 1979). 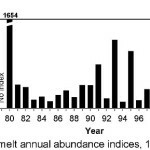 The Delta Smelt index was the lowest it has been since the trawl surveys were initiated nearly 50 years ago. Other pelagic fish species – including the striped bass, longfin smelt, threadfin shad, and American shad – were also near recorded lows. Last week, the Supreme Court turned down appeals from Central Valley farmers and water districts to consider overturning pumping restrictions that had been put in place in 2008 to protect the Delta Smelt. -The Department of Water Resources has increased expected water deliveries to State Water Project customers from 10% to 15% of their requested amount. -Last week, the U.S. Bureau of Reclamation and the California Department of Water Resources (DWR), together with the other state and federal agencies, submitted a Drought Contingency Plan to the State Water Resources Control Board for the Central Valley Project and State Water Project. 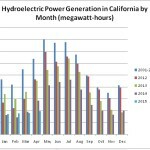 -The USDA released this year’s first water supply forecasts, which expect 2015 spring and summer streamflows to be below normal in California. -The National Oceanic and Atmospheric Administration published an article showing that most of the state would need more than double the average precipitation that falls between mid-December and September in order to bring the total precipitation for the past four years out of the bottom 50% of the historical record. The U.S. Seasonal Drought Outlook is predicting the drought will linger or worsen in most of California, with drought in southern California remaining but improving. Drought conditions have worsened in some parts of California; 39% of the state is in exceptional drought, up from 32% last week. 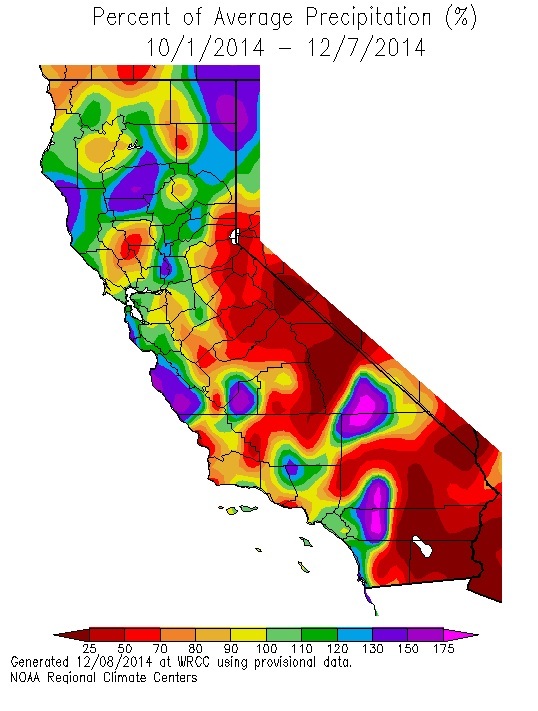 Average precipitation has been below normal for the past two weeks in most of California, except for areas in and around San Bernardino and Inyo Counties. Snow water equivalent in the state is 36% of normal for this time of year. Statewide, California’s major reservoirs (representing 27.3 million acre-feet of storage) are at 38% of capacity and 61% of normal. -This month, Cambria will begin operation of a new desalination plant. The project, proposed in May, had been fast-tracked as a result of the drought and with the help of Governor Brown’s drought declaration. -In 2014, CAL FIRE responded to 5,620 wildfires across the state, which burned 90,606 acres in State Responsibility Areas (SRA), areas where CAL FIRE has jurisdiction. These figures are higher than the average 4,681 wildfires on 88,169 acres of SRA land. –Two weeks ago, the House of Representatives voted to approve HR 5781, the California Emergency Drought Relief Act of 2014. Although Congress has already left for winter break, the bill could be taken up again by the new Congress in 2015. 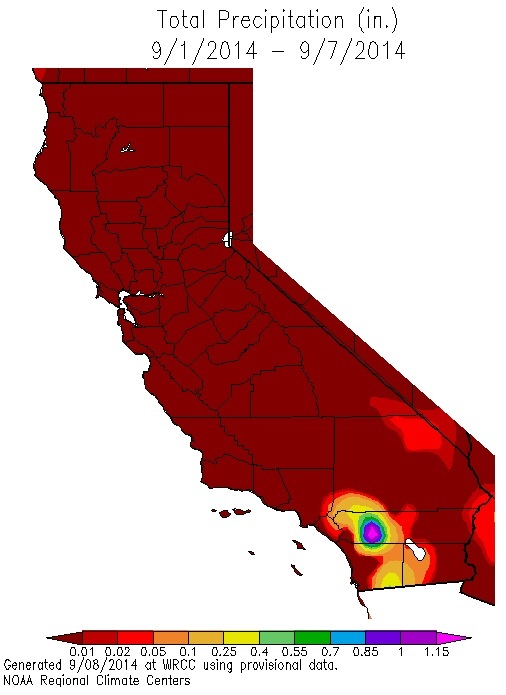 -UCLA scientists published a report on the impact of climate change to the Los Angeles region. The research suggests that, while flooding can be expected to increase as more precipitation falls in the form of rain rather than snow, the average amount of precipitation is not expected to change much in the coming decades. -Last week, NASA scientists presented findings that show it would take 11 trillion gallons of water for California to recover from the drought. 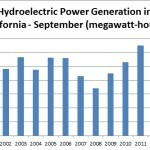 -The San Francisco Public Utilities Commission signed a $113 million agreement with San Bruno, Daly City, and the California Water Service Company, where, during wet years, the Commission will sell excess Hetch Hetchy water so these areas on the Peninsula can fill up their groundwater reservoirs. -The Department of Water Resources announced that it expects to deliver 10% of requests to water users on the State Water Project. This is up from the 5% that was delivered last year. 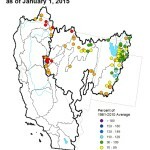 -The State Board lifted the water use curtailment restrictions on the Scotts River Watershed. -Congress has restarted the debate over a bill to increase water deliveries from north to south. Although Republicans hope to pass a bill before Congress adjourns, White House advisors have already recommended Obama veto the bill. -A new PPIC poll shows that 70% of respondents would vote yes for local bond measures that would improve local water infrastructure. The State Water Resources Control Board has lifted the curtailment orders on most water diversions in the state. These curtailment orders had been issued this May and June to more than 10,000 post-1914 water rights holders in order to protect the rights of senior water rights holders as well as downstream riparian users. Curtailment orders remain in effect in Scott River in Siskiyou County and Deer Creek in Tehama County. The State Board said the curtailments have been lifted because of recent rainfall and reduced demand. 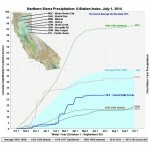 Precipitation for this water year remains below average in most of the state, except in certain parts of northern California and areas of Monterey, Kings, and Tulare Counties. -The San Diego City Council unanimously voted to approve a $2.5 billion project to recycle wastewater into drinking water. –A new report suggests that California’s waters system could probably only utilize about six million acre-feet of additional storage. Additional storage beyond that amount would be limited by precipitation and the water transportation system. 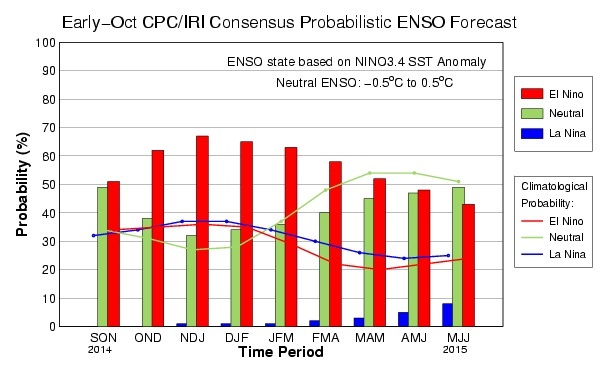 The probability of an El Niño developing in November has dropped to 58%, from 67% last month. Statewide, California’s major reservoirs (representing 27.2 million acre-feet of storage), are at about 27% of total capacity and 49% of normal. The state’s five largest reservoirs (Shasta, Oroville, Trinity Lake, and New Melones) are below 25% capacity. The U.S. Energy Information Administration released the Electric Power Monthly report for September. 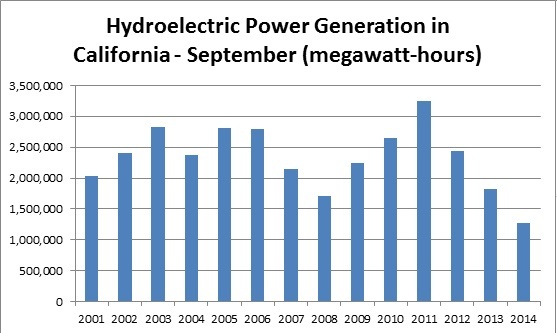 September generation was 70% of last year and 52% of the 2001-2011 average. For the first time in many months, the U.S. 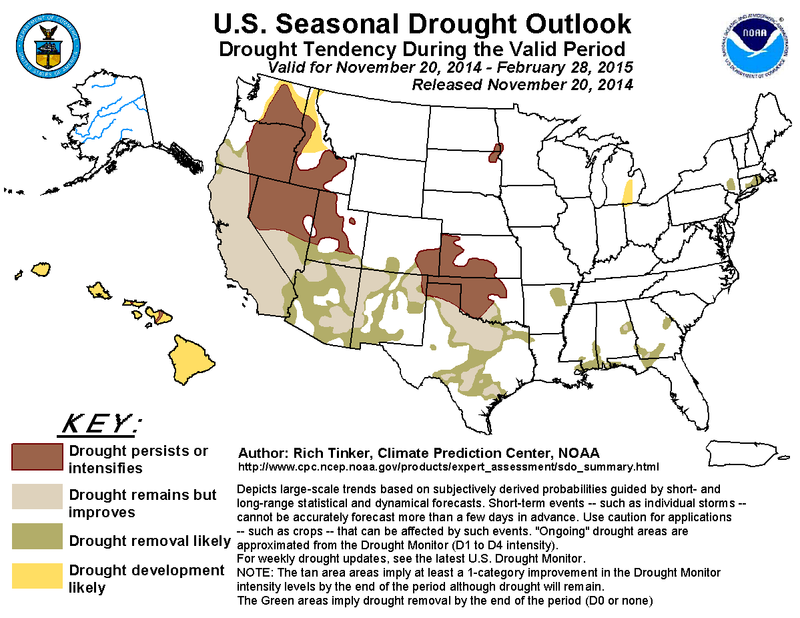 Seasonal Drought Outlook is predicting the drought in California will improve between now and the end of February. Unfortunately, the Outlook predicts the drought status will be removed in only a small part of southern California. Last week, the State Water Resources Control Board released a database describing residential water use in more than 400 water agencies in the state. The State Board reported that 87% of utilities surveyed are implementing mandatory restrictions on residential water use. Statewide, utilities reported a 10% savings in September 2014 compared to 2013. 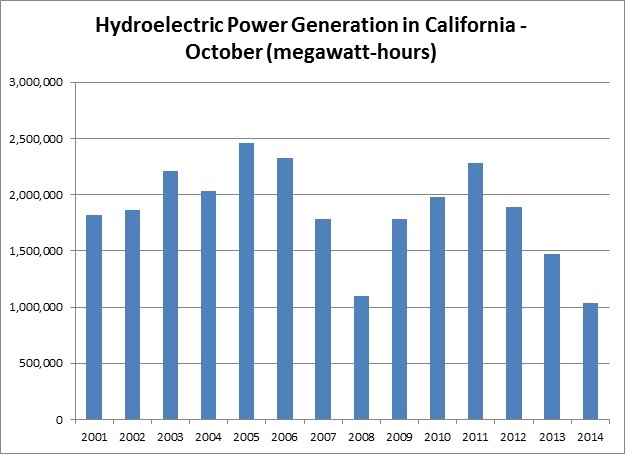 The San Francisco Bay, Sacramento River, and Central Coast all reduced daily per capita residential water use by more than 15% between September 2013 and 2014. -The California Department of Water Resources has awarded $220 million in grants to 27 proposals to help California communities provide immediate drought relief and prepare for future droughts. -The Friant Water Authority and most of its member agencies have filed a petition for writ of mandate in Fresno County Superior Court, seeking a judicial review of the State Board’s actions this spring and summer that reduced allocations to junior water rights holders to zero. -Later this week, the Cambria Community Services District will open a new brackish water desalination plant on the San Simeon Creek that could produce up to 250 acre-feet per year. The plant was approved through an emergency permit and would only operate under State 3 drought conditions. Drought conditions have improved slightly this week, but not by much; 55% of the state remains in “exceptional drought”. 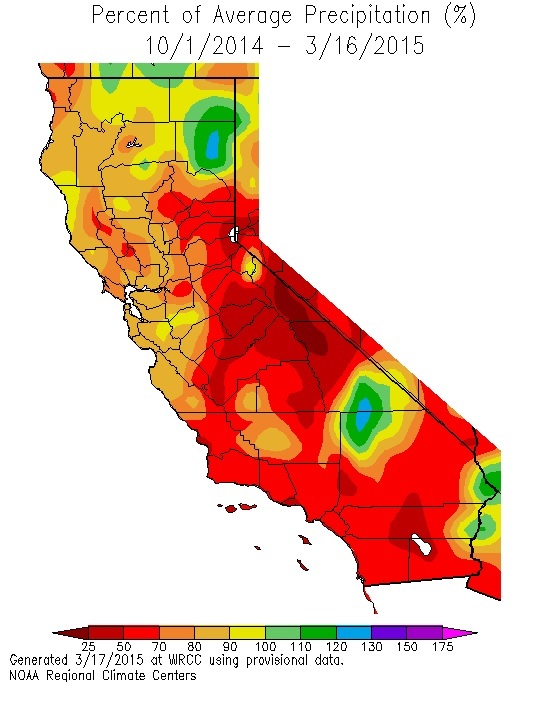 Precipitation since the start of the water year has been below normal in most of the state, except for a few areas in northern California, the Central Coast, and the Tulare Lake Basin. 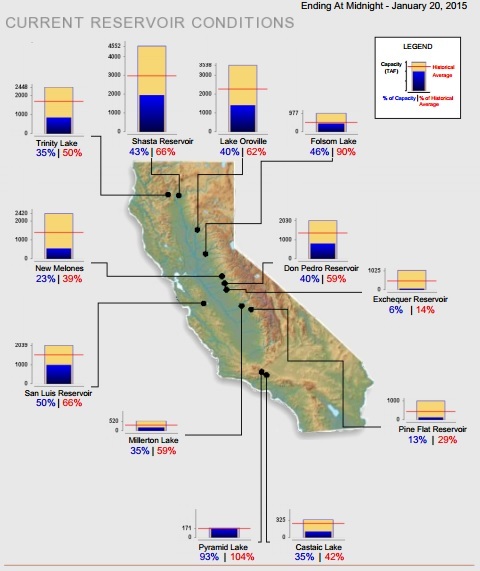 Statewide, California’s major reservoirs (representing nearly 26.6 million acre-feet of storage), are at about 27% of total capacity and 49% of normal. Migratory bird species will likely have a difficult year. This past year, federal wildlife refuges reliant on the Central Valley Project only received 50% of their water allocation, reducing the amount of habitat as well as food supplies for the birds. To make matters worse, the U.S. Fish and Wildlife Service is predicting that a larger than average population of migratory birds because of better breeding conditions last winter in Alaska and Canada. 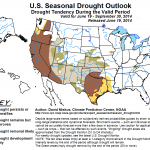 The drought will also increase the spread of avian diseases. Crowding of birds increases the spread of diseases such as cholera and botulism, which also thrive in low, warm, oxygen-depleted waters. In the Tule National Wildlife Refuge in northern California, 10,000 ducks and geese have died this year from avian botulism. A new program lead by The Nature Conservancy is allowing conservationists to “rent” land from rice farms, flooding the fields temporarily at the most critical points of the season when migration is highest and the amount of wetland habitat is expected to be particularly scarce. –A new tool from the Center for Watershed Science at the University of California, Davis has identified 181 dams in California that are likely depriving downstream fish of the flows necessary for their survival. Drought conditions are unchanged from two weeks ago. 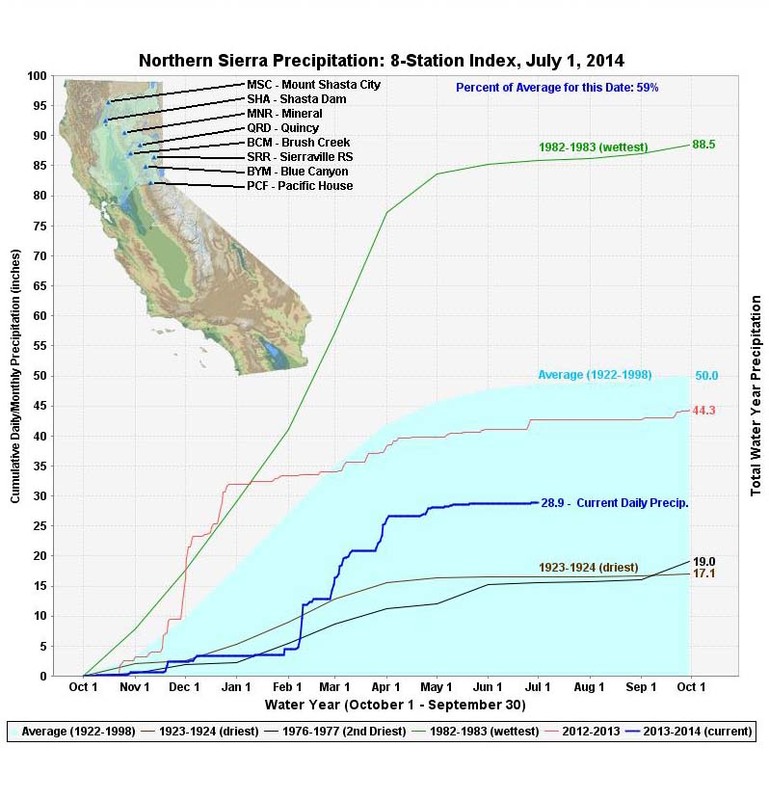 Precipitation since the start of the water year has been below normal in most of the state, except for a few counties in northern California. 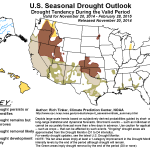 The new seasonal drought outlook from the National Weather Service’s Climate Prediction Center predicts the drought will improve somewhat in the northwest and the southernmost portion of California, but will remain unchanged or worsen in the rest of the state. The U.S. Energy Information Administration released the Electric Power Monthly report for August. 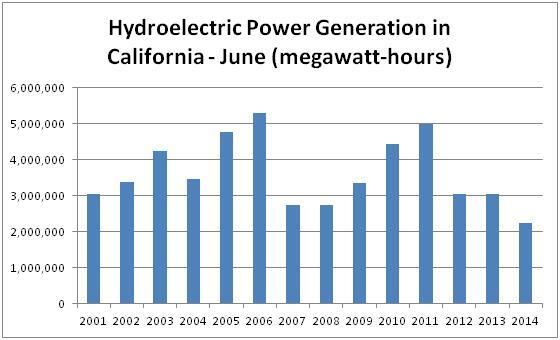 July generation was 72% of last year and 58% of the 2001-2011 average. Counties in California have reported nearly 1,000 homes that rely on groundwater as well as very small water systems are currently experiencing water shortages. 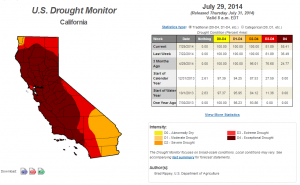 Dozens of reports have been written about wells running dry throughout the Central Valley. East Porterville has been hit particularly hard; nearly 1,000 residents currently have no running water. Nearly 300 homes began receiving bottled water in August and some wells in the area reportedly went dry as early as April. In mid-September, Governor Brown signed an executive order streamlining efforts to provide water to those with the greatest need. The order provides funding through the California Disaster Assistance Act to get drinking water and water for sanitation to homes that have no running water. The order also prohibits price gouging and directs state agencies to work with local agencies to identify and implement solutions to water shortages. –According to a survey from the State Water Resources Control Board, water suppliers in California reduced their water use in August 11.5% over the previous year. -The Association of California Water Agencies released a series of resources regarding the new groundwater legislation. –Since January 1st, CAL FIRE has responded to 5,224 wildfires on 91,792 acres. The year-to-date historical average is 4,263 wildfires on 88,470 acres. These figures only represent CALFIRE incidents and so the total number of fires and acres burned is much higher. 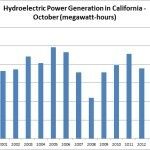 –On October 3rd, the State Board declared that water right holders in the Sacramento, San Joaquin, Russian, and Eel river watersheds whose water rights have been curtailed may be able to divert or store water on a temporary basis, in the event of significant precipitation this fall and winter. 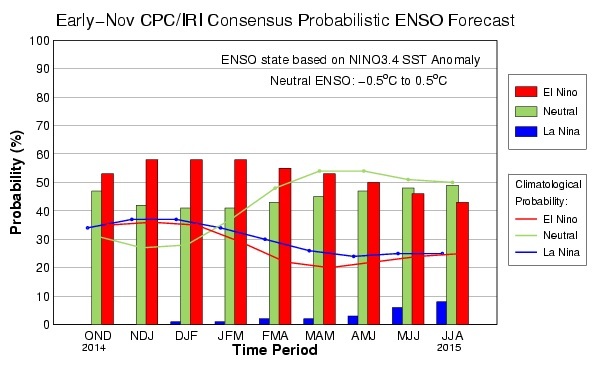 The probability of an El Niño developing in November is 67%. Statewide, California’s major reservoirs (representing nearly 26.6 million acre-feet of storage), are at about 28% of total capacity and 49% of normal. Today, Governor Brown will sign into law new legislation designed to ensure the sustainability of the state’s groundwater resource. The bill would allow a groundwater management agency to regulate groundwater use, register pumps, and require users to measure their use. The law will take many years to implement; the most at-risk basins have until 2020 to develop and implement a groundwater sustainability plan that outlines objectives for achieving their sustainability goals within 20 years of the plan’s adoption. The legislation defines “sustainable management” as groundwater use that does not cause “undesirable results,” such as chronic lowering of groundwater levels, reductions in storage, seawater intrusion, or land subsidence. –A new poll shows that, while nearly two-thirds of likely voters hadn’t heard anything about Proposition 1, the water bond that’s on the ballot in November, more than half of those surveyed would vote yes on it. -Three hundred sixty-two urban water suppliers reported progress on conservation efforts to the State Water Resources Control Board. 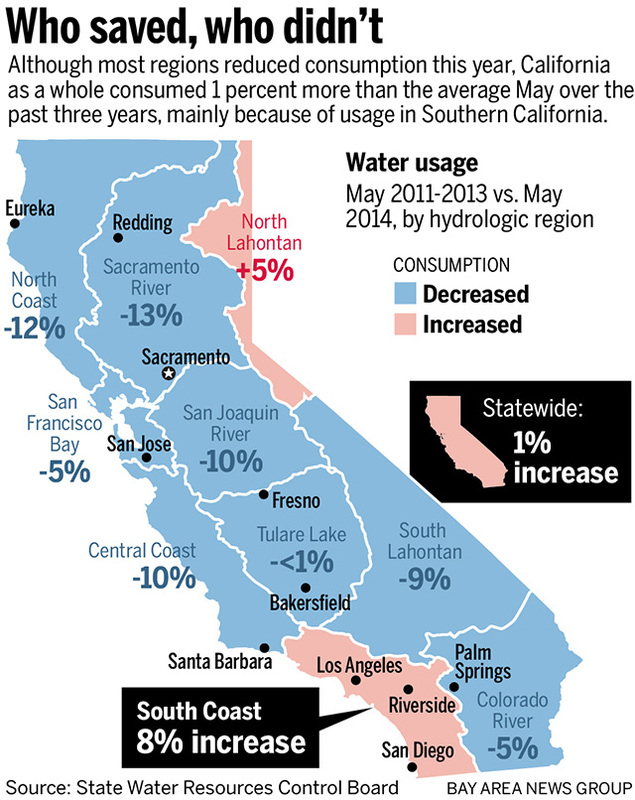 In July, statewide urban water use dropped 7.5% from last year’s use. 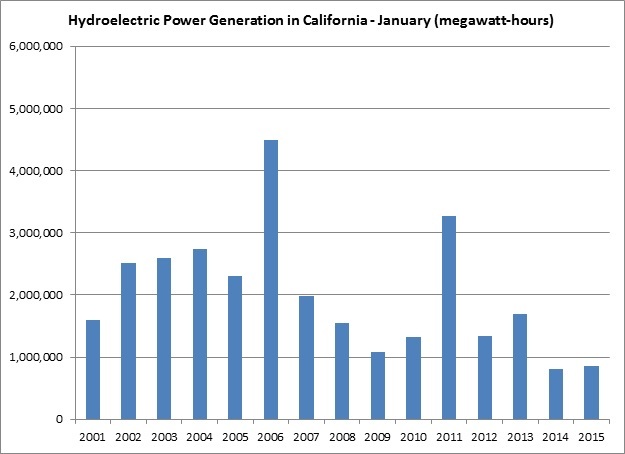 -According to NOAA’s National Climate Data Center, 2014 has been the warmest on record in California, with a temperature 4.1°F above the 20th century average. This map shows how far temperature has departed from the average since January 1st. –Since January 1st, CAL FIRE has responded to 4,750 wildfires on 84,784 acres. The year-to-date historical average is 3,777 wildfires on 84,356 acres. These figures only represent CALFIRE incidents and so the total number of fires and acres burned is much higher. Statewide, California’s major reservoirs (representing more than 27.2 million acre-feet of storage), are at about 31% of total capacity and 52% of normal. The state’s five largest reservoirs (Shasta, Trinity, New Melones, San Luis, and Oroville) are all below 31%. -The California Department of Food and Agriculture released the results of a survey that examines how the drought has impacted almond farms. The survey shows that more than 67% of respondents will rely entirely on groundwater this year to water their almond trees, while only 38% only utilize groundwater in a normal year. 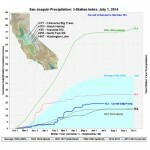 -Some dry creeks are now flowing with groundwater as a result of Napa’s recent earthquake. –New research suggests that, over the next century, the southwest has at least a 50% chance of experiencing a decade-long drought and a 20-50% chance of experiencing a “megadrought” (one that lasts more than 30 years). -Next10 has released the “California Water Challenge,” an online simulation that lets users understand the impact of different water policy options. Last week, a package of groundwater legislation (AB1739 and companion bills SB 1168 and SB1319) passed the legislature and will now go to Governor Brown, who is expected to sign it. Together the bills would require local agencies to implement groundwater management programs and establish the conditions for state intervention in groundwater management. Two weeks ago, two pieces of legislation passed the State Senate and Assembly. AB 2636 establishes CalConserve, a revolving-loan program to finance water-efficiency projects for home owners and businesses, and help cities and counties reach their water-reduction goals. In addition, AB 2282 requires the state to adopt building standards for recycled water in newly constructed commercial and residential buildings. 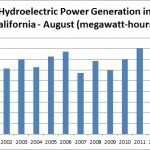 Both bills now go to Governor Brown for approval. Last week, the State Senate passed Senate Bill 985, which improves the stormwater resource planning process to encourage the capture and use of stormwater and dry weather runoff. –New research suggests Climate change could reduce the supply of surface water runoff from mountains by accelerating vegetation growth at higher elevations and increasing evapotranspiration. This research, published in the Proceedings of the National Academy of Sciences, uses the upper Kings River basin as a case study. –Since January 1st, CAL FIRE has responded to 4,429 wildfires on 84,833 acres. The year-to-date historical average is 3,471 wildfires on 73,061 acres. These figures only represent CALFIRE incidents and so the total number of fires and acres burned is much higher. Above-normal rainfall in the Mojave Desert has improved drought conditions in a small part of California. 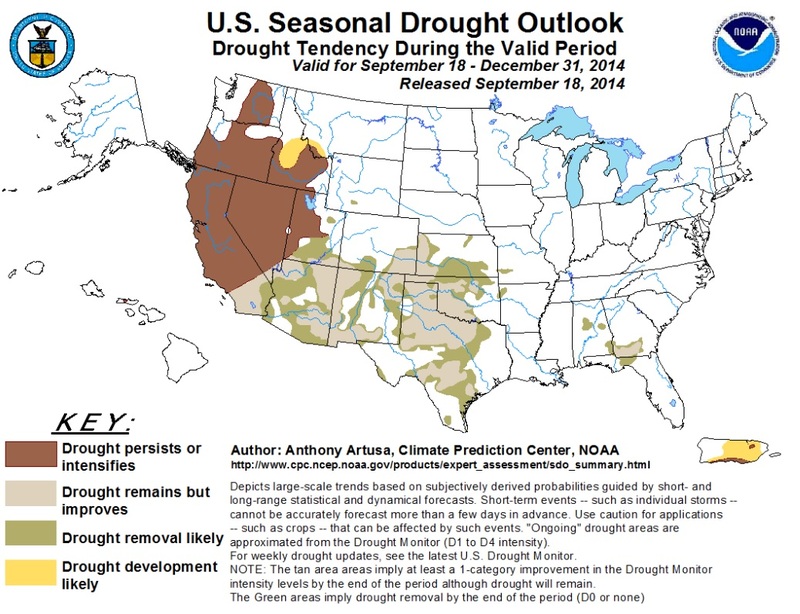 However, this improvement will not have an effect on overall drought conditions in the state. Statewide, California’s major reservoirs (representing more than 26.6 million acre-feet of storage), are at about 31% of total capacity and 51% of normal. 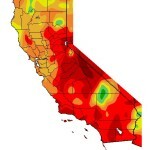 –New research from UC San Diego’s Scripps Institution of Oceanography and the U.S. Geological Survey (USGS) shows the recent drought is causing an “uplift” effect in California’s mountains, with more than half an inch and on average 0.15 of an inch increase across the west. Researchers estimate the ground and surface water deficit to be around 63 trillion gallons. –USGS has released the 2010 California water use estimates. 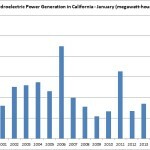 In 2010, USGS estimates Californians withdrew 38 billion gallons per day. USGS releases these estimates every five years; results for the rest of the U.S. will be released later this year. –A new report in Environmental Research Letters shows that water rights allocations in California are approximately five times the state’s mean annual runoff. –Since January 1st, CAL FIRE has responded to 4,294 wildfires on 84,048 acres. The year-to-date historical average is 3,311 wildfires on 67,492 acres. These figures only represent CALFIRE incidents and so the total number of fires and acres burned is much higher. Big news this week in the state capital…On August 13th, Governor Brown signed a scaled-down water bond that will go on the November ballot this year. The $11.4 billion bond from 2009 was cut to $7.5 billion, in order to improve its chance of gaining voter support. Although supporters cite the current drought as justification for the bond, opponents argue the bond does little to address the current or future droughts. The new bond does provide $2.7 billion for water storage projects and $725 million for water recycling and advanced water treatment technology projects, however, these projects will be years or decades away from completion. -CPUC has ordered water utilities under its jurisdiction to provide notification to customers of water use restrictions and potential fines, consistent with the State Water Resources Control Board’s recent emergency drought regulations. -Since January 1st, CAL FIRE has responded to 4,132 wildfires on 80,634 acres. The year-to-date historical average is 3,153 wildfires on 57,290 acres. These figures only represent CALFIRE incidents and so the total number of fires and acres burned is much higher. 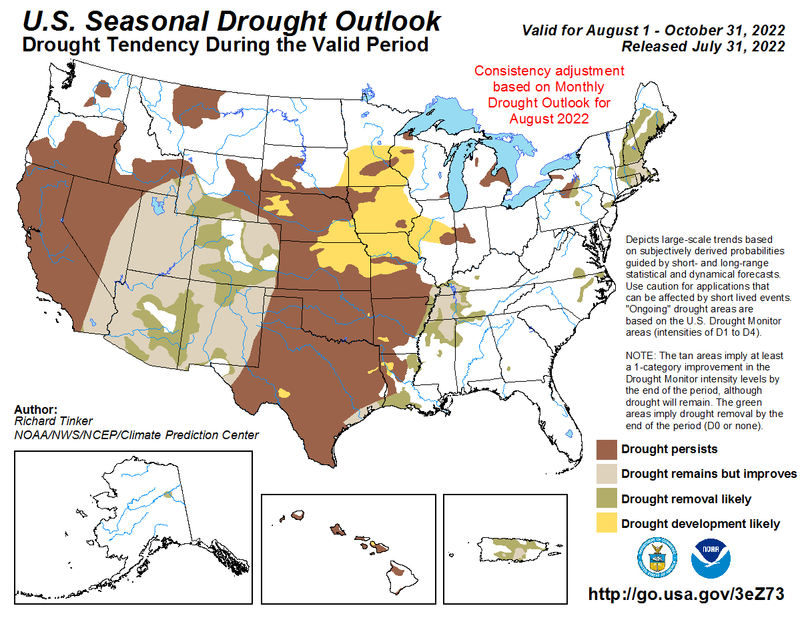 Drought conditions remain unchanged from last week. Statewide, California’s major reservoirs (representing more than 26.6 million acre-feet of storage), are at about 33% of total capacity and 51% of normal. – The Groundwater Voices Coalition released a report highlighting groundwater issues in the Central Coast aquifer. – The US Bureau of Reclamation has come to an agreement with PacifiCorp that would allow the Bureau to ensure Upper Klamath Lake remains above a specified minimum elevation. -Since January 1st, CAL FIRE has responded to 3,959 wildfires on 55,882 acres. The year-to-date historical average is 2,994 wildfires on 44,143 acres. These figures only represent CALFIRE incidents and so the total number of fires and acres burned is much higher. -The U.S. Drought Monitor has increased the intensity of drought conditions in some of California; currently more than 58% of the state is now considered to be in exceptional drought, the most severe category, up from 36.5% last week – a significant jump – and 82% is in extreme drought. – Governor Brown has issued an emergency proclamation for the state of California due to the effects of wildfires in northern California. Since last week, CAL FIRE has responded to 251 fires that have burned 6,568 acres, bringing the year-to-date totals to 3,813 wildfires on 44,408 acres. – On Thursday, the U.S. Bureau of Reclamation issued a “Finding of No Significant Impact” report for a proposal to allow the transfer and sale of 13,000 acre-feet of Merced County groundwater to the Del Puerto Water District and the Patterson Irrigation District over the next two years. – Mandatory emergency water use restrictions that were approved by the State Water Resources Control Board on July 15th went into effect July 29th. Some areas are not likely to impose the $500 fine that the legislation allows, while others have implemented smaller fines or are currently discussing alternative enforcement mechanisms. – On July 30th, the U.S. Bureau of Reclamation announced that it will not be releasing extra, cool water from Trinity Lake to the Trinity and Klamath rivers for chinook salmon and steelhead. Instead, the Bureau will use the limited supply to prevent large fish kills of endangered species in other runs in the Central Valley. – Stanford’s Water in the West program has released a series about groundwater management in California. The series takes an in-depth look at available groundwater data, aquifer recharge, and groundwater conflicts in California. – On August 1st,the U.S. Court of Appeals for the Federal Circuit ruled that the U.S. Bureau of Reclamation owes “expectancy” damages to the Central San Joaquin Water Conservation District for failure to deliver sufficient water from the New Melones Reservoir. Salmon in Northern California’s Klamath Basin are starting to feel the effects of the drought. In a population survey this week, the Department of Fish and Wildlife found 54 adult and hundreds of juvenile salmon dead in the Salmon River. A majority of the dead fish were chinook salmon, which usually die in the fall after spawning. Fisheries managers are worried about the impact of low levels and higher temperatures in the Klamath and its tributaries, the same conditions that led to a massive fish kill in the Klamath in 2002. 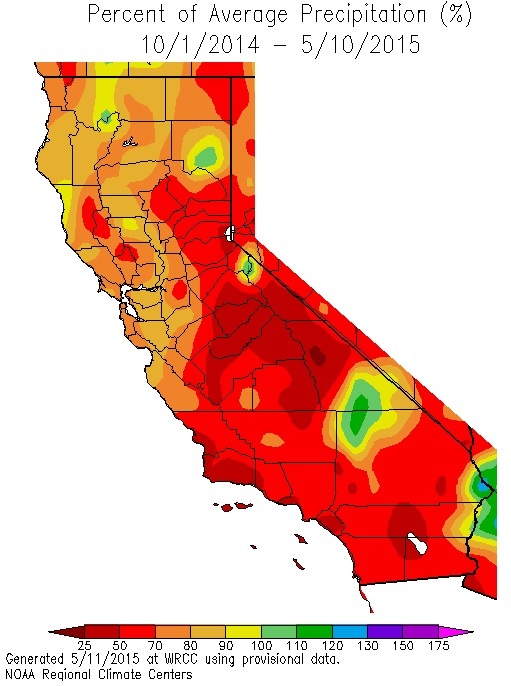 The water level in the Salmon is currently 42% of average, exacerbating the already unseasonably warm temperatures California has been having this year. According to the National Climate Data Center, 2014 has been the warmest period on record in California, with the average temperature between January and June 4.8°F above the 20th century average. The warm water stresses the fish and makes them more susceptible to diseases such as gill rot. The Klamath Fish Health Assessment Team continues to monitor the situation. – The Public Policy Institute of California conducted a state-wide poll of California residents. In an open-ended question about the most important environmental issue facing California today, 35% cited water supply or drought. This is the first time water supply has been cited as the top concern since the annual survey was implemented in 2000. – A poll published by the Groundwater Voices Coalition found strong public support for comprehensive proposal establishing a groundwater management plan and approach for California. – CAL FIRE has responded to 3,562 wildfires on 37,840 acres since January 1. The year-to-date historical average is 2,619 wildfires on 34,192 acres. The Bully Fire, which started on July 11th, is now fully contained, having burned 12,661 acres. – The State Water Resources Control Board continues to receive responses to its water conservation survey (the details of which are being criticized, most vocally from the San Diego County Water Authority). 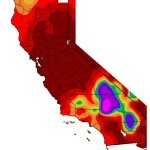 – A new report from the Groundwater Voices Coalition indicates subsidence in the San Joaquin Valley is at record high levels, in some areas occurring at a rate of one foot per year. Drought conditions were mostly unchanged this week. Statewide, California’s major reservoirs (representing more than 27 million acre-feet of storage, are at about 37% of total capacity and 54% of normal. The U.S. 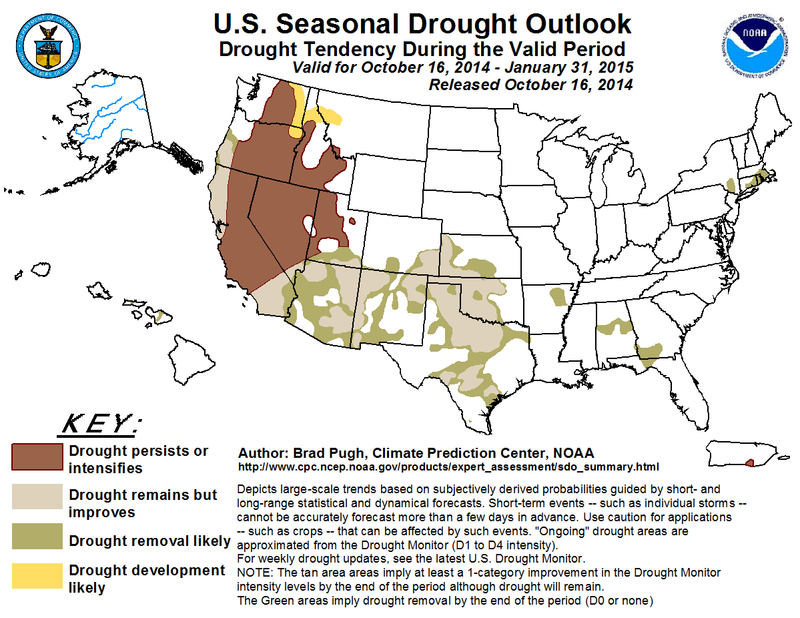 Seasonal Drought Outlook from National Oceanic and Atmospheric Administration predicts the drought will continue through October. Last Tuesday, Sacramento Superior Court Judge Allen Sumner ordered Siskiyou County to regulate groundwater pumping in order to protect the Scott River. The Environmental Law Foundation, the Pacific Coast Federation of Fishermen’s Associations, and the Institute for Fisheries Resources brought the case against the county and the State Water Resources Control Board after groundwater pumping had caused water levels in the Scotts River to decline dramatically, in some cases to the point where the river would dry up in the summer and fall, impacting fish and, notably, navigability. The county is expected to appeal the decision. – The Environmental Law Foundation is also busy sending letters to agricultural water districts that have not developed their Agricultural Water Management Plans, as required by legislation, threatening suit if they do not. – On Tuesday, the State Board approved an emergency regulation to improve water conservation in urban areas. – USDA is providing $9.7 million in emergency water assistance to 73,000 residents in 11 California counties. Droughts conditions as measured by the US Drought Monitor worsened this week, with nearly 82% of the state in extreme drought, up from 79% last week. Statewide, California’s major reservoirs are at about 38% of total capacity and 53% of normal. A new State Board survey showed water use in May increased 1% from the past two years, although the increase was concentrated in the North Lahontan and South Coast hydrologic regions. This week, the State Water Resources Control Board will consider implementing statewide emergency regulations imposing mandatory restrictions on outdoor water use in urban areas. These would include a prohibition against overwater landscapes; hosing down hardscapes; washing cars unless the hose has a shut-off nozzle; and using potable, non-recirculated water in fountains or other decorative water features. Violating these prohibitions could incur a fine of $500 for each day in which the violation occurs. In addition, these emergency regulations would require urban water suppliers to implement their Water Shortage Contingency Plans such that any mandatory restrictions on outdoor water use would be in effect. Although urban water suppliers with more than 3,000 water connections must have these plans in place, 40% do not. Urban water suppliers without contingency plans and those serving fewer than 3,000 connections must require customers to limit outdoor irrigation. The emergency regulations will be considered at State Board’s July 15th meeting and, if approved, would go into effect August 1st. The California Water Foundation has published a new report analyzing groundwater management planning in California through an evaluation of 120 Groundwater Management Plans. A group of California State legislators as well as a group of California farmers and farm interests sent letters to Congress, urging them to consider and pass the Emergency Drought Relief Act. 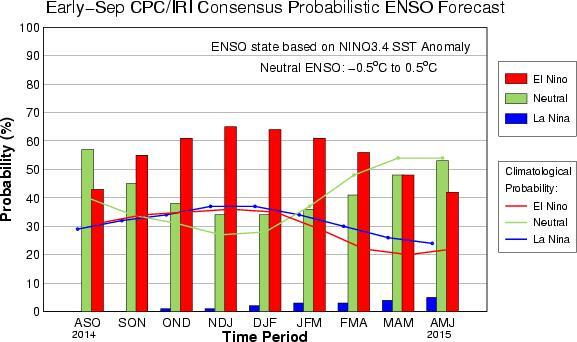 Forecasts are predicting that a weak-to-moderate strength El Niño will develop during the late fall and early winter. 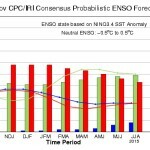 The chance of El Niño is now about 70% during the summer and close to 80% during the fall and early winter, down slightly from previous predictions. Statewide, California’s major reservoirs are at about 41% of total capacity and 55% of normal. Northern California has had a few large fires this month already. A fire that started on July 1 in Napa County is now 90% contained at 4,300 acres burned. The Monticello Fire in Yolo County has burned more than 6,000 acres and is 35% contained. Although evacuation orders have now been lifted, triple-digit temperatures and high winds continue to pose a threat to homes in the area. 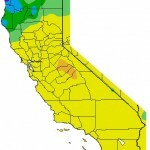 The National Weather Service issued Fire Weather Watches for parts of northern California. A Fire Weather Watch is issued when weather conditions conducive to fire could exist in the next 12-72 hours. According to the California Department of Forestry and Fire Protection (CAL FIRE), these types of weather patterns include low relative humidity, strong winds, dry fuels, the possibility of dry lightning strikes, or any combination of the above. According to CALFIRE’s incident information website, more than 57,000 acres have burned in 2014 to date. Click on the table icon for a list of July fires; please visit CAL FIRE’s website for a more complete list of fires to date. -The State Water Resources Control Board has issued curtailment notices to post-1914 water users on the North Fork Eel River, Main Stem Eel River, and the Van Duzen tributary. Last week the State Board approved emergency regulations to assure compliance with water rights curtailment orders. -The California Almond objective forecast for the 2014–2015 crop year – funded by the Almond Board of California and administered by the United States Department of Agriculture (USDA) – has been issued. The forecast is predicting 2.1 billion meat pounds of almonds this year, up 7% from the USDA forecast issued in May. 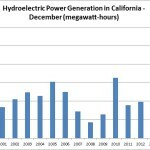 -The California legislature has adjourned for summer recess without agreeing to a new 2014 water bond, but has indicated they will continue to work on it through the summer. The drought got slightly worse this week; nearly 79% of the state is in extreme drought and more than 36% is in exception drought, up from 77% and 33% last week. 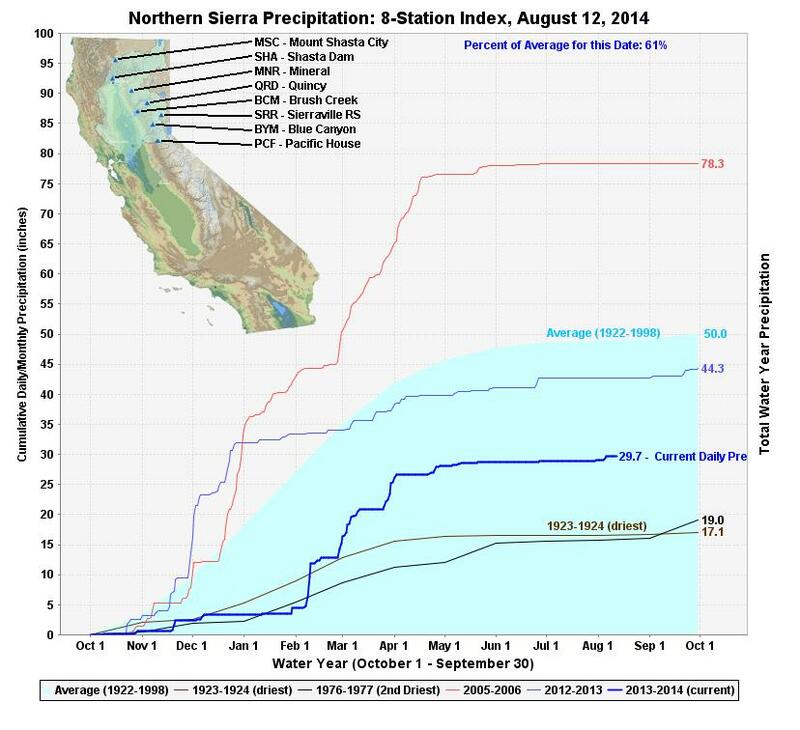 California’s rainy season has officially, closing out the third below-average rainfall season in a row. 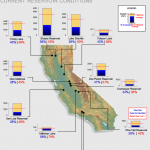 Statewide, California’s major reservoirs are at about 40% of total capacity and 54% of normal. Senate Bill 848 – Lois Wolk’s $10.5 billion water bond – stalled in the Senate last week after failing to garner the two-third s majority support when Senate President Pro Tem Darrell Steinberg brought the legislation to a vote on Monday. Although the measure is not dead, it lost more traction on Tuesday when Governor Brown stepped in with a proposal for a $6 billion bond, the details of which legislators are now discussing. The water bond is set to go on the ballot in November, but the legislature fears the current $11.1 billion bond won’t win voter support. Legislators say they intend to pass a modified bond before they go on recess on July 3rd. -According to the most recent update of the U.S. Department of Agriculture’s Food Price Outlook, the prices for fresh fruits will go up an estimated 5-6% in the coming months, up from the 4% projected in May. The Outlook maintained the May projection of a 3.5% increase in U.S. food prices this year over last. –The Modesto Bee reports that groundwater-dependent residences in Stanislaus County are starting to report that their wells are drying up. The U.S. Energy Information Administration released the Electric Power Monthly for April. 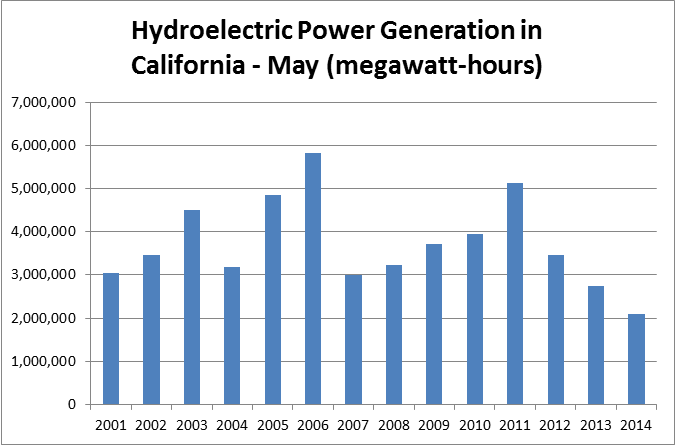 April generation was 62% of last year and lower than any other year since 2001. 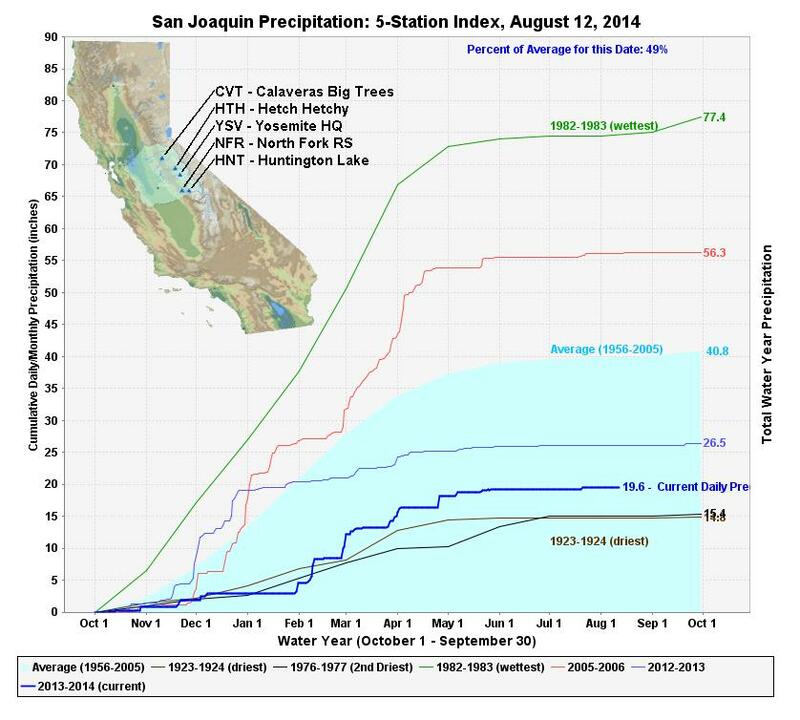 Cumulative precipitation for this water year to date is 59% of normal in the northern Sierras and 49% of normal in the San Joaquin, respectively. 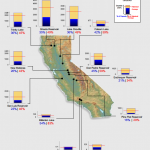 Statewide, California’s major reservoirs are at about 42% of total capacity and 55% of normal. 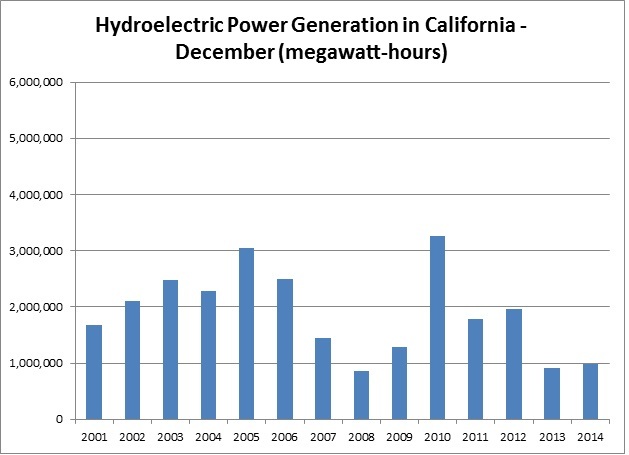 Within seven days of being issued a curtailment notice, water rights holders must submit a compliance certification form, indicating they have complied with the curtailment order. As of June 20, only 21%have submitted the form. –Another new survey shows Californians are concerned about the drought and a majority consider drought conditions to be the “new normal” in the state. -California Department of Fish and Wildlife is releasing trout and steelhead fish from hatcheries on the American River earlier than expected; low water levels as a result of the drought are causing increased temperatures, which can be lethal to the fish. 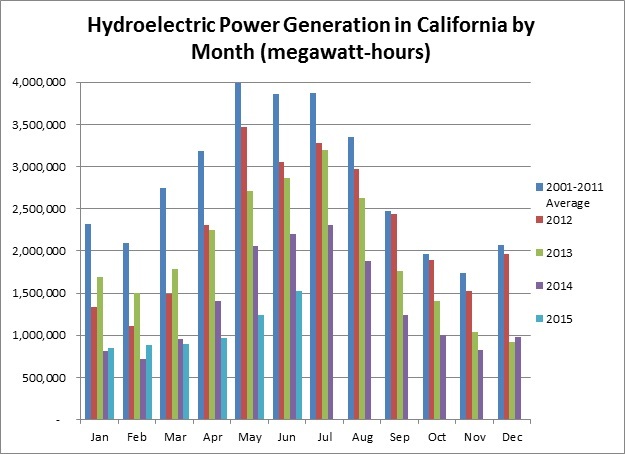 In other American River news, water flows into the river from Nimbus Dam were increased last week in order to help inhibit saltwater intrusion into the Sacramento-San Joaquin Delta. -Last Monday, a state appeals court restored the power of the State Board to restrict water use by grape growers. Although a Mendocino County judge previously ruled that the State Board lacked authority, the First District Court of Appeals in San Francisco ruled that the board has the power to stop growers from “using water in an unreasonable manner” and to decide when the protection of wildlife habitat outweighs growers’ needs. –A survey conducted by the State Board shows that, statewide, California has cut its water use by 5% since January, compared to January-May average water use over the past three years. 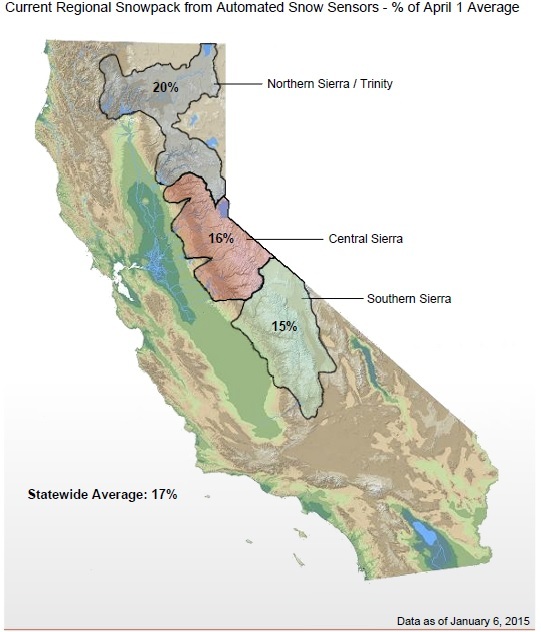 The Regional Water Authority – a joint powers authority formed to promote collaborative water management in Sacramento, Placer, and El Dorado counties – reports their region has cut water use 18% compared to the previous two years. -The California Department of Forestry and Fire Protection (CAL FIRE) is banning burning on 31 million acres of California state lands. The number of fires CAL FIRE has responded to so far this year is up 70% from the historical average. UC Riverside posted a short, interesting video of Richard Minnich, a professor of Earth sciences, discussing the 2014 fire season in Southern California. According to a new poll by USC and the LA Times, a majority of Californians believe the drought is a major problem, although most do not want to pay money to address it. Although 89% of respondents believe the drought is a crisis or major problem, only 36% would support using taxpayer dollars to improve storage and delivery systems. The poll also found 78% of Democrats and 44% of Republicans believe climate change was very or somewhat responsible for California’s water supply problems. In addition, 55% of respondents said they would not support legislation that would roll back federal fish protections in order to increase water deliveries. Although this poll found (as did a recent study by the Public Policy Institute of California) a vast majority of residents say they are taking steps to reduce their water use, only 16% of respondents feel as though they have been personally impacted by the drought. A story published today by the San Francisco Chronicle shows that the Bay Area has not yet achieved the 20% reduction Governor Jerry Brown called for in his January drought emergency declaration. 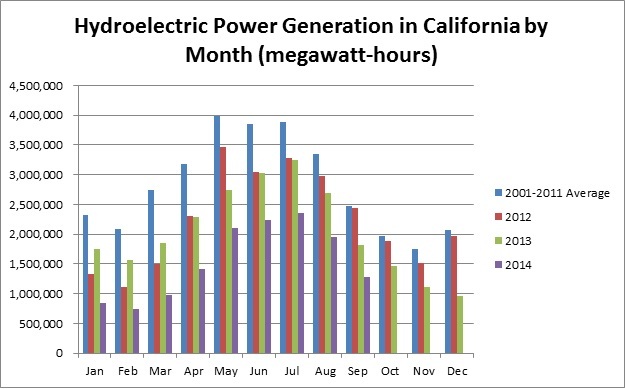 Between February and April, customers of the East Bay Municipal Utility District reduced their consumption by 3% and residents of San Francisco reduced their use by 8%. 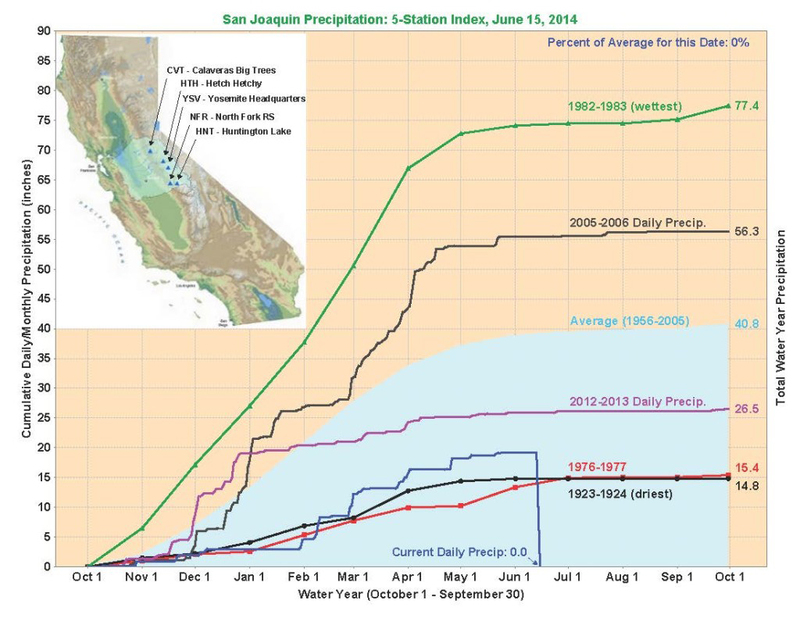 In San Jose, water use in the first quarter of this year was actually up from previous years. 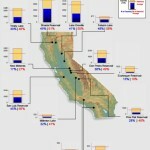 However, the SF Bay region already uses less water per capita than most areas of the state and so one would expect reductions to come more slowly than in other areas. Another explanation may be that customers need time to respond to the call for conservation – installing a low-flow shower head, for example, isn’t a free or immediate response. 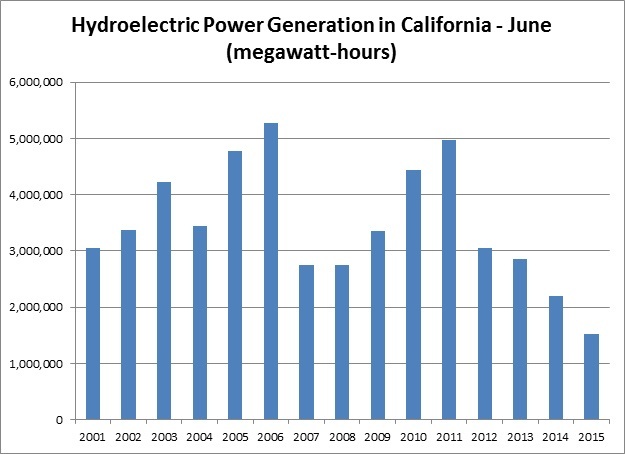 The figures cited by the Chronicle do not include summer months when water use peaks, and so increased savings may be forthcoming. In response to the drought declaration issued by Governor Brown in April, the State Water Resources Control Board has issued new guidance to streamline permitting the use of treated wastewater for irrigation. 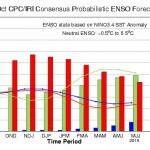 The International Research Institute for Climate and Society at Columbia University has issued their June ENSO forecast. 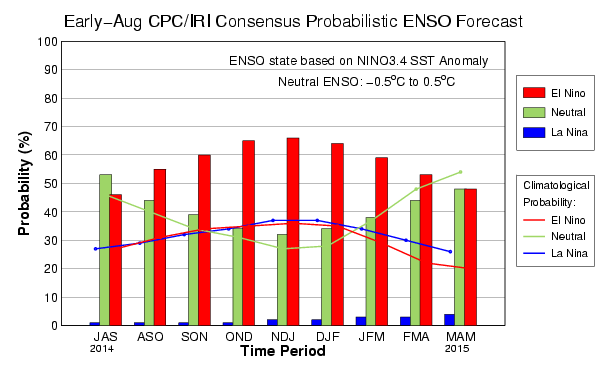 The probability an El Niño will develop by October is now 82%, up from 78% last month. However, forecasts predict only a moderate-strength event, which might not be sufficient to generate the statewide precipitation that usually occurs during stronger events. 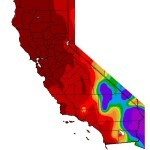 Average temperatures in most of California have been higher than average this past week. 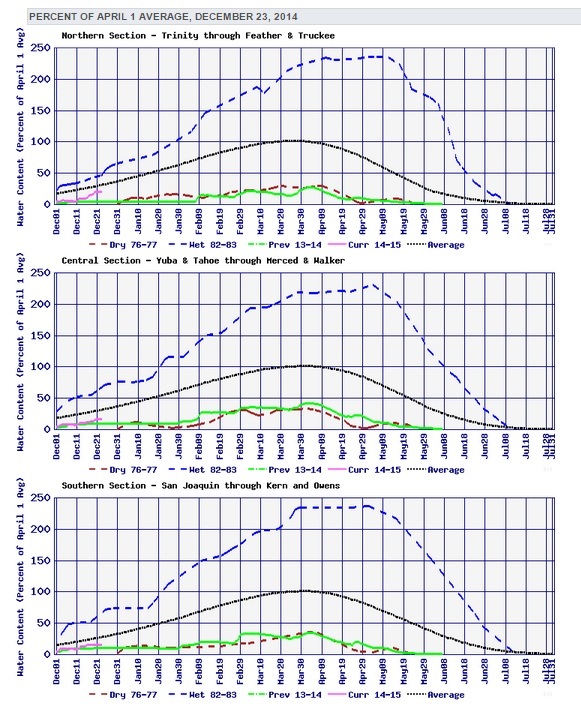 Monitoring stations indicate California snowpack is effectively at zero.These graphs show the current and historic percent of the April 1st average snowpack. According to the graph, snowpack is generally about 20% of the April 1st average by this time of year, but is approaching zero. 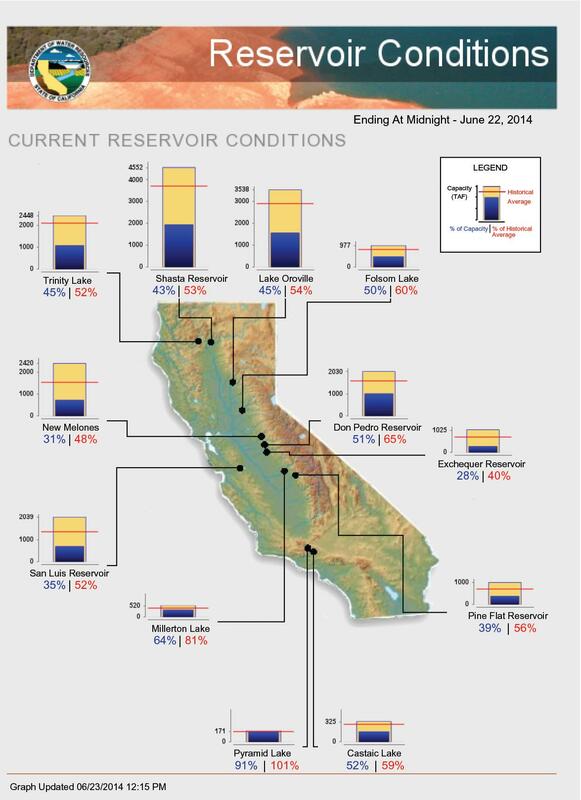 Statewide, California’s major reservoirs are at about 46% of total capacity and 59% of normal. 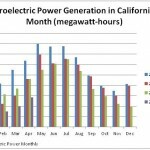 The U.S. Energy Information Administration released the last Electric Power Monthly at the end of May. Hydropower generation in 2014 through March is down significantly from the recent historical average. The next monthly update is due out at the end of June. – According to the USDA’s crop progress report, 95% percent of the rice crops are in fair to excellent condition, while 75% of the pasture and range land was rated as being in poor or very poor conditions. As a result, cattle are requiring supplemental feeding and nutrients, and many are being moved out of the state. Increased production costs and lower yields have resulted in alfalfa prices that are currently 50% higher than they were this time last year. 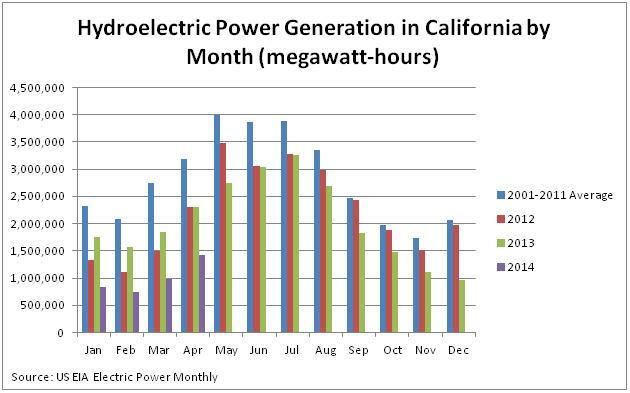 – The 2014 California almond forecast came out on May 1st and is predicting a very good year for the industry. Although production is forecast to be down 2.5%, total bearing acreage in 2014 is predicted to continue upward, with a 24% increase from 2013. Although the report does not discuss water availability assumptions, it does note that, “water is a concern for many growers this year.” Forecasts for other crops were not available. 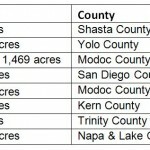 – The USDA has also released California’s 2013 walnut acreage report. 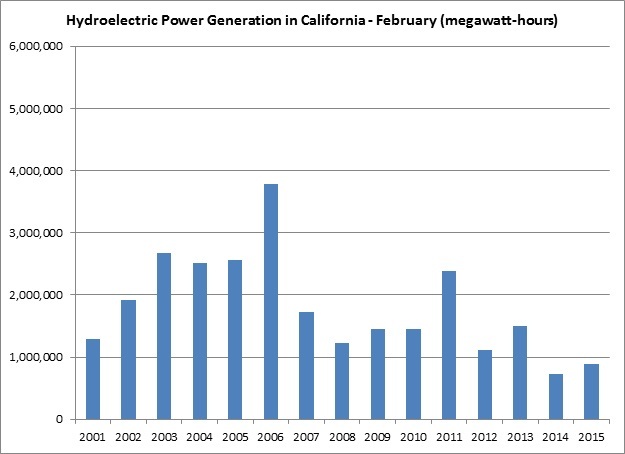 In 2013, walnut acreage and production were up 8.3% and 6.7%, respectively, from 2011. The 2013 grape acreage report also shows increases in production, with total grape acreage up 3.7% from 2012. 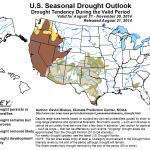 – It is still unclear what the drought’s impact will be on California’s citrus crops. The majority of citrus is grown in the Friant Water Authority’s service area, which is not receiving water deliveries from Millerton Lake. As a result, farmers in this area must rely on more expensive groundwater or purchased water, or else let their orchards go unwatered. – The USDA has designated the California Bay Delta (including the Central Valley) as a Critical Conservation Area (CCA). The CCA – under the Regional Conservation Partnership Program – connects businesses, non-profits, universities, and federal, state and local governments with agricultural and conservation groups to invest in innovative water and soil conservation projects. The overall goal of the California Bay Delta CCA is to promote water conservation, improve water quality and restore wildlife habitat throughout the Bay-Delta region. – The State Water Resources Control Board has ordered post-1914 water rights holders in the Sacramento and San Joaquin River watersheds to stop diversions. SWRCB has also established drought emergency minimum flow requirements in Mill, Deer, and Antelope Creeks. – The Friant Water Authority (FWA) had petitioned the courts to stop the flow of Millerton Lake water to contractors with pre-1914 water rights, pending the outcome of their lawsuit against the Bureau of Reclamation to resume deliveries to FWA contractors on the east side of the valley. However, the U.S. District Court in Fresno has refused, and deliveries to the exchange contractors will continue. Average temperatures in most of northern California and parts of southern California have been higher than average this past week. 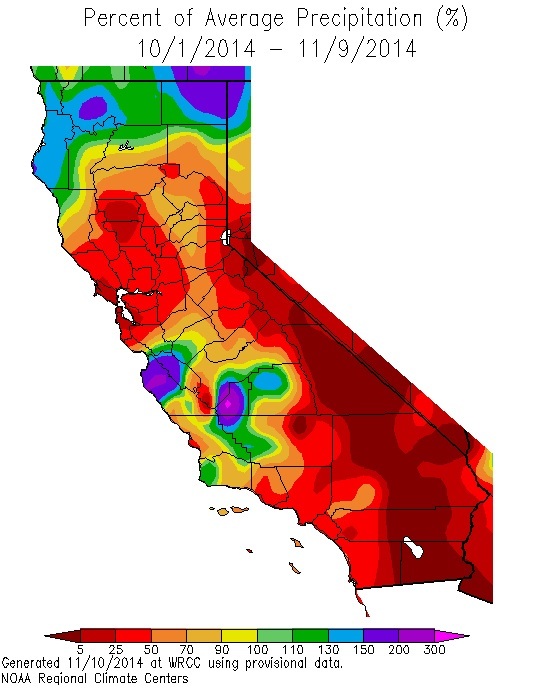 California snowpack is currently 3% of what’s normal for May 29th and 1% of the April 1st average. According to the 28 automatic snow sensors in the Southern Sierra, there is no more snow in the that area. Reservoir conditions haven’t changed much since last week. Statewide, California’s major reservoirs are at about 48% of total capacity and 62% of normal. – The Fresno Bee reports that the US Bureau of Reclamation estimates 15-40% losses from evaporation and percolation in delivering Millerton Lake water through the San Joaquin River. 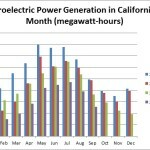 – New research shows a 46% reduction in winter fog over the past three decades in the Central Valley. Tule fog is essential for crops such as almonds, pistachios, cherries, apricots, and peaches. – Circle of Blue has produced some cool infographics about the drought: one depicts a graph of historical drought trends, another maps California’s canal system, this one is an interactive dashboard showing current conditions and historical trends for major reservoirs, and this interactive map shows water use by county. We’re doing another wildfire update sooner than expected, as several large fires have broken out in the San Diego area in just the past few days. The largest of these are in the area around Camp Pendleton. The Pulgas Fire, which broke out yesterday afternoon, is the most recent and has already burned 8,000 acres around the Marine Corps Base at Camp Pendleton. The fire is only 5% contained. This is the third fire the base has been battling with assistance from other local fire response teams. The Tomahawk Fire broke out in the morning on May 14, having spread from the Naval Weapons Station in Fallbrook to Camp Pendleton. This fire has now engulfed 6,300 acres and is 23% contained. –On Tuesday, for the first time ever, the U.S. Bureau of Reclamation (USBR) announced that on Thursday it would begin delivering Millerton Lake water to the San Joaquin River Exchange Contractors. Although the USBR has historically met its contractual obligations to the Exchange Contractors with water from the Delta, because of the drought, it says it must supplement with water from the San Joaquin River. The Friant Water Authority, a public joint-powers agency representing 21 water agencies along the southern San Joaquin Valley’s East Side and which operates and maintains the Friant-Kern Canal for the USBR, has expressed frustration with the USBR’s decision. 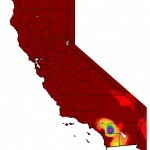 –New research published this week in the journal Nature suggests that groundwater withdrawals in the Central Valley may be increasing the frequency of earthquakes. 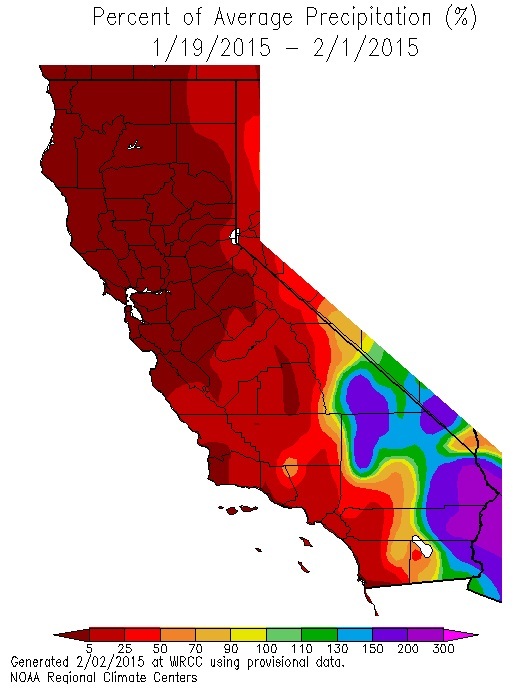 Although conditions haven’t changed much from last week, the entire state of California is now considered to be in at least “severe drought” conditions, with 77% of the state in extreme drought and 25% in exceptional drought. 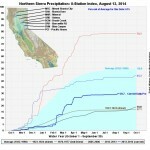 Northern California received some precipitation this week, but the rest of the state remains rainless. California snowpack is currently 4% of the April 1 average, down from 9% last week. This graph shows statewide percent of average conditions on May 1 for 2001 through 2014 for snowpack, precipitation, runoff, and reservoir storage. Reservoir conditions haven’t changed much since last week. Statewide, California’s major reservoirs are at about 49% of total capacity and about 64% of historical average. Levels in the state’s nine largest reservoirs – which together hold about 74% of the state’s total capacity – are below 60% of their historical average and below 47% of their total capacity. 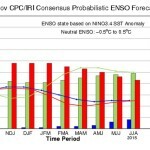 Federal weather forecasters at the National Oceanic and Atmospheric Administration have increased the probability that an El Niño weather system will develop this winter to 78%, up from 66% last month. According to the International Research Institute for Climate and Society at Columbia University, El Niño events tend to develop between April and June, and reach maximum strength between December and February. 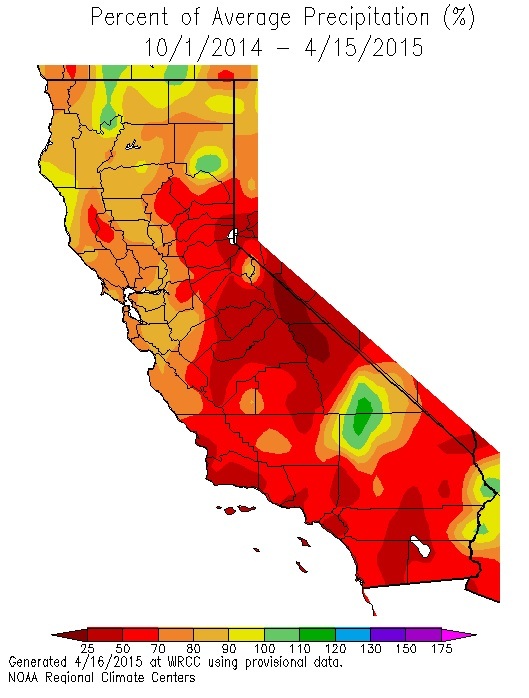 Although these events tend to produce more rainfall in California, development of an El Niño would not guarantee an end to drought conditions. 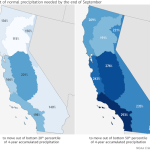 While they tend to produce wetter conditions in southern California, precipitation in central and northern California is more unpredictable. “I don’t want to recommend that you invest any of your retirement in the umbrella market yet,” said Bill Patzert, a research scientist and oceanographer at NASA’s Jet Propulsion Laboratory in Pasadena. In addition, El Niño events are characterized by sea surface temperatures that are warmer than average. Couple this with warming that is already occurring as a result of increased greenhouse gasses in the atmosphere, and an El Niño event could result in significantly higher global temperatures. 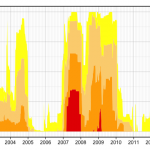 The 1998 and 2005 El Niño years were the warmest on record. Higher temperatures would result in more precipitation in the form of rain rather than snow, increasing the risk of flooding, landslides, and coastal erosion, and reducing the amount of water storage in snowpack. 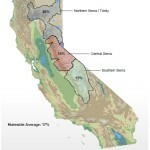 -On May 5th, the California Water Foundation released a framework for sustainable groundwater management. The report was put together with input from water agencies and associations, natural resource conservation advocates, environmental justice advocates, county representatives, representatives from the agriculture industry, farm bureaus, water quality advocates, and legislative and administrative officials. -The U.S. National Climate Assessment Report was released on Tuesday and the report’s findings aren’t pretty (although the website certainly is). -The Kern County Water Agency is putting together a plan to reverse the flow of the California Aqueduct, bringing up to 8 million gallons per day from the Kern Water Bank to parched farmers along a 47 mile stretch of the Central Valley. There has been effectively no change in statewide drought conditions from last week. Except for a patch of rain in Fresno County and minimal precipitation in the north, most of central and southern California received little to no rain this past week. This graph from the California Department of Water Resources shows the percent of average precipitation for the water year for cities throughout California. South Lake Tahoe has had the highest percent of normal precipitation at 68%, with average precipitation in Palm Springs a mere 19% of normal. The color indicates regional river conditions; visit DWR’s website for more detailed information on river levels and flows. California snowpack is currently at about 9% of the April 1st average, down from 13% last week. The final snow survey of the year was released on May 1st, which found the snowpack water content at about 18% of the May 1st average. This graph shows statewide percent of average conditions on April 1st for 2001 through 2014. 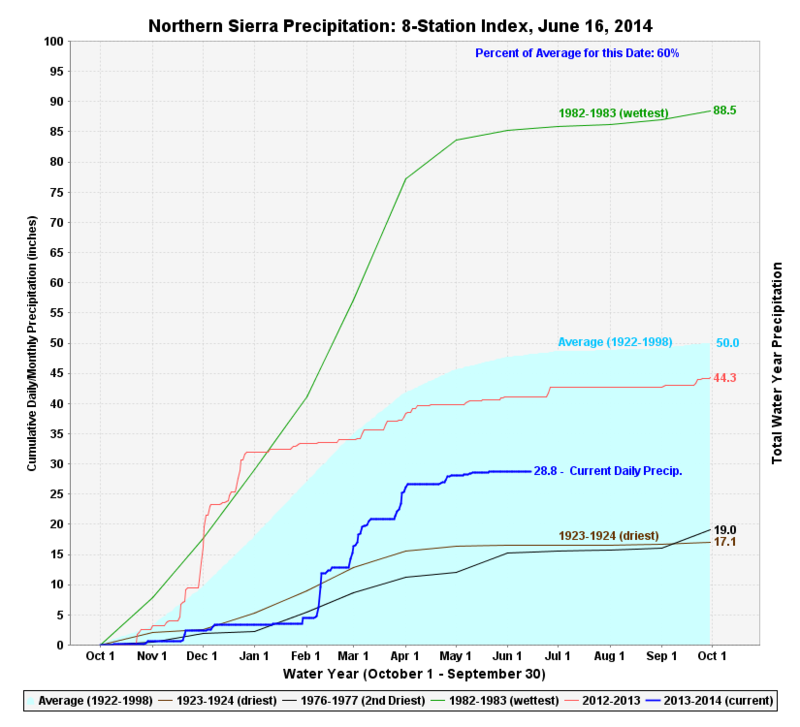 The graph includes averages for snowpack, precipitation, runoff, and reservoir storage. May has yet to be updated, but we’ll post it when it is. 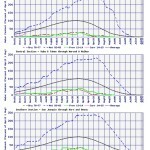 Reservoir conditions haven’t changed much at all since last week. Wildfire Awareness Week begins on Sunday and 2014 has already seen a handful of large fires throughout the state. Since January 1, California has had 14 wildfires that have burned 6,764 acres. An April 29 fire in San Bernardino County is currently 53% contained and has so far burned 2,190 acres in an area north of Rancho Cucamonga. The Etiwanda fire, which forced the evacuation of 1,600 homes, was helped along by strong Santa Ana winds, withstrong gusts that prevented low-flying firefighting aircraft from entering the area. 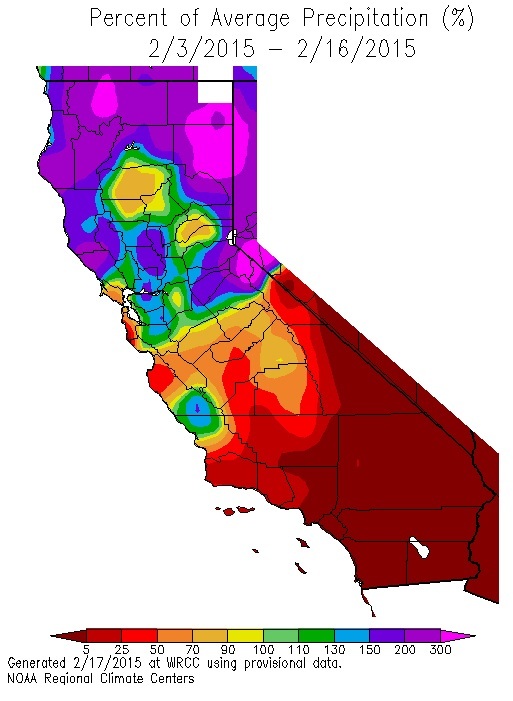 Yesterday, The National Interagency Fire Center issued their monthly National Significant Wildland Fire Potential Outlook for May through August, with above-normal fire potential expected to begin in June for most of California and persist through August. 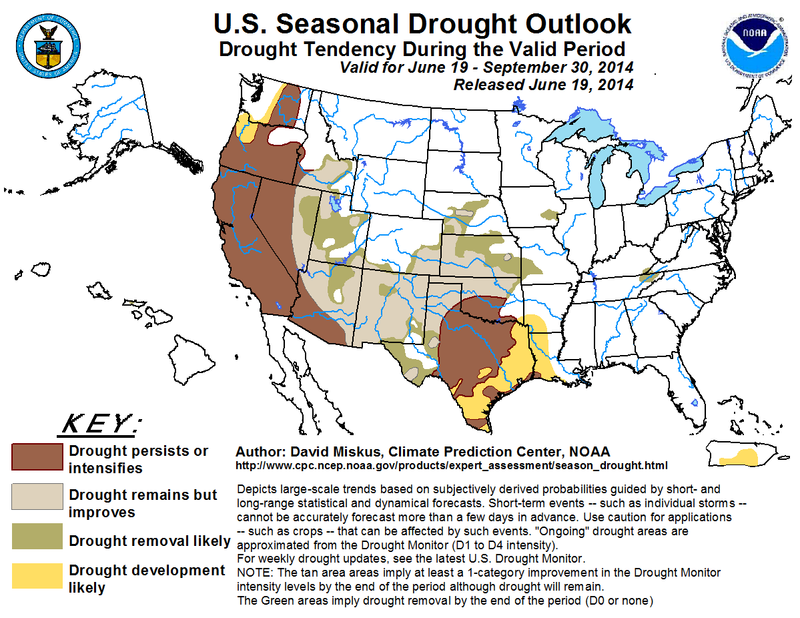 The outlook noted that current dryness conditions are near record dry levels, conditions that usually aren’t seen until mid-June. 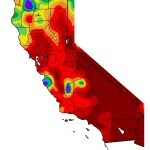 Fuels are expected to remain critically dry from mid-June through the end of the fire season. -The Department of Water Resources released a report to the Governor’s drought task force, as required by the January drought declaration. The report finds that the majority of the state’s groundwater is at historic lows and is continuing to decline. The recent Executive Order requires that an updated report be submitted in November 2014. -On Friday, April 25, Governor Jerry Brown issued an executive order to strengthen the state’s efforts to manage drought. -The State Water Resources Control Board is projecting to deliver curtailment orders for most junior water rights holders in 10 different rivers and their watersheds. This would be the first time this has happened since 1977. On April 18th, the Department of Water Resources increased State Water Project Allocations from 0% to 5%. 1991 was the last time allocations were cut this low, when municipal customers received 30% of their allocation, while agriculture received none. Today, DWR does not distinguish between customer types when making allocations. The SWP – which delivers water to 29 contractors in California – will still deliver “carryover” water stored by local agencies and water transfers, as well as sufficient supplies for drinking, sanitation and fire protection. In other Allocation News… …Sacramento River Settlement contractors and Central Valley Project refuges will receive 75% of their contracted supply, up from 40% last week. …State Water Resources Control Board approved a deal that will allow the Merced Irrigation District to take an additional 30,000 acre-feet of water from Lake McClure. …After hearing their allocation would be cut in half, districts with strong water rights on the Feather River will receive their full allocation. Some districts are also considering selling about 20% of their water to State Water Contractors south of the delta, at the cost of $500 per acre-foot. …And for the first time ever, East Bay Municipal Utility District will get water from the Sacramento River. 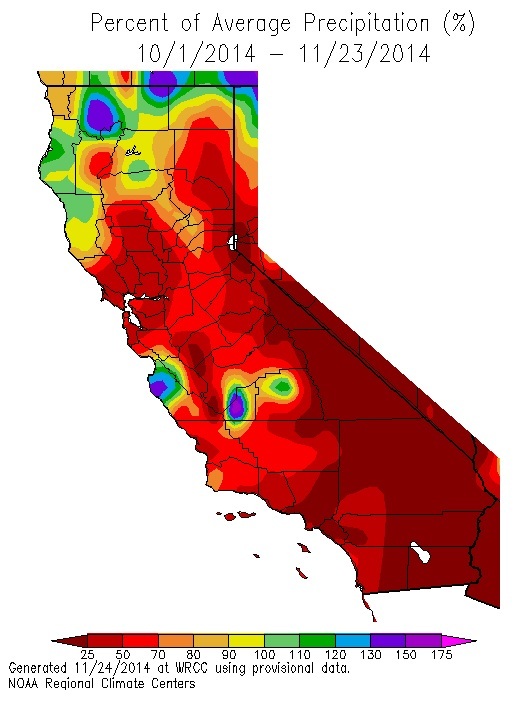 Groundwater has been on the lips (both literally and metaphorically) of Californians since the drought began. During normal years, groundwater use accounts for about 40% of total water use in the state and can increase up to 60% or more during dry years. 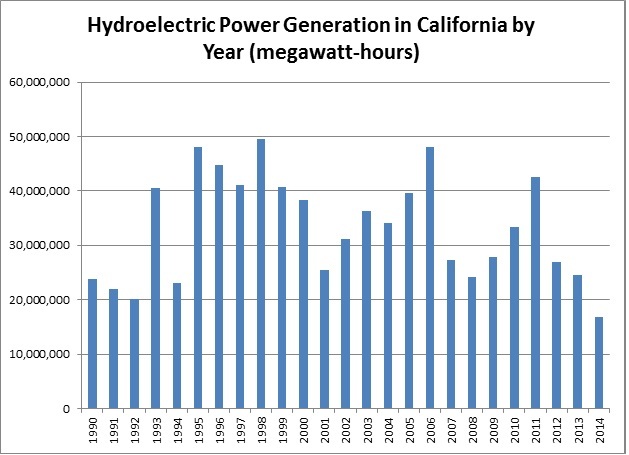 This has resulted in groundwater levels that have been steadily declining since the early 1960s and these levels have yet to totally rebound, indicating unsustainable use (see figure). In the current drought, farmers and residents are already drilling more and deeper wells. In some counties, new drilling permit applications are more than double (in some areas quadruple) what they were this time last year. 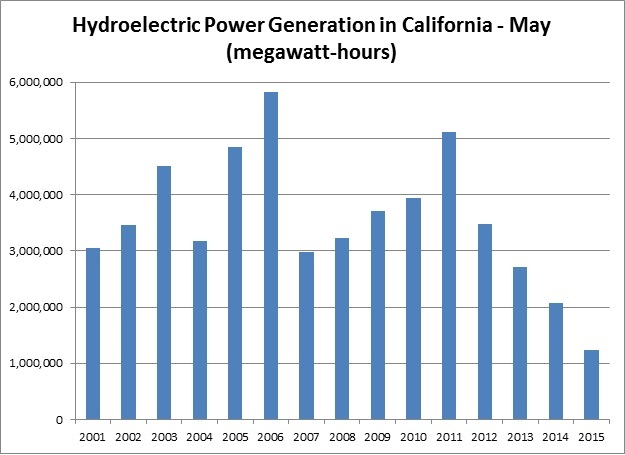 State regulators, water managers, and other decision makers have been taking notice. Yesterday, California state agencies held a workshop to discuss proposed solutions to implementing improved groundwater management. At the workshop, several organizations – including the Association of California Water Agencies, The National Heritage Institute, the Planning and Conservation League, the Valley AG Water Coalition, and the California Water Foundation – gave presentations outlining their solutions. These proposals generally agreed that the state’s focus should be on enabling improvement of local or regional management of groundwater. Plans also noted the importance of defining “sustainable” management; improving data collection and monitoring; identifying a reliable source of funding for improvement projects; and increasing the use and effectiveness of groundwater management plans. Below is the April 18th update of the key information and graphics on the status of the current drought. Much of this information can be found at our California Drought website: www.californiadrought.org. According to the US Drought Monitor, California drought conditions have not changed since last week, with more than 95% of the state still experiencing moderate to exceptional drought conditions and 100% of the state in some form of abnormally dry circumstances. Yesterday, the National Weather Service’s Climate Prediction Center issued their monthly Seasonal Drought Outlook for April 17th through July 31st. The map indicates that California can expect the drought to persist or intensify during this period. 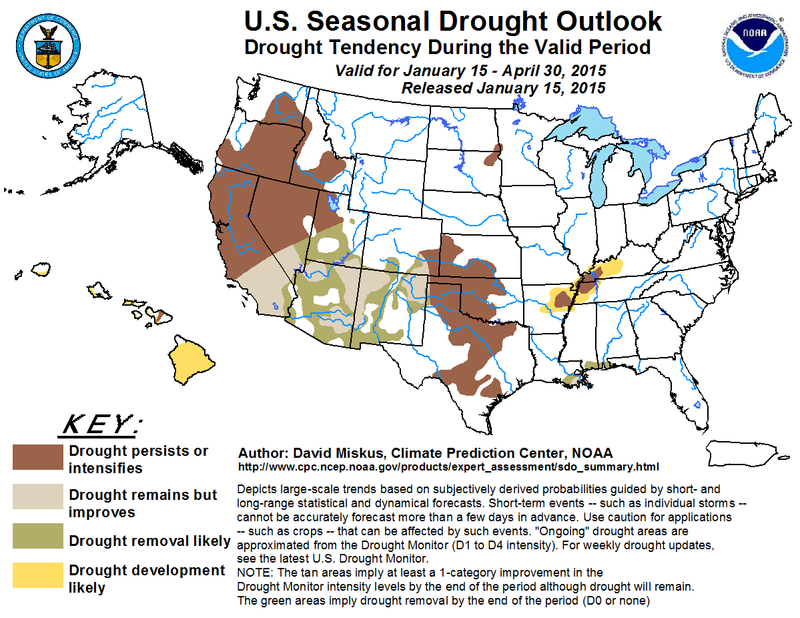 In addition, the outlook shows that most of Oregon, Nevada, Arizona, and New Mexico can also expect the current drought to persist or intensify. Other states with large areas that are also expected to continue to be affected include Utah, Idaho, Washington, Oklahoma, Texas, Kansas, and Colorado. We have effectively come to the end of the rainy season, and so it is unlikely that we will see any significant change in precipitation until October. 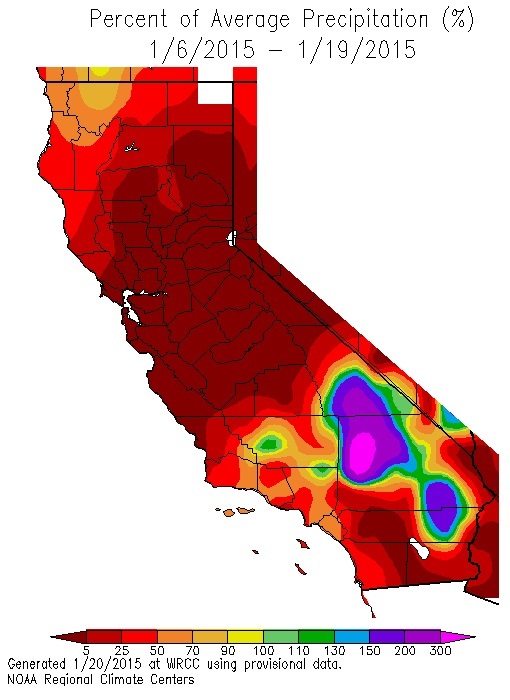 This map from NOAA’s Climate Data Center shows the precipitation deficit since the start of California’s water year on October 1st through April 17th. 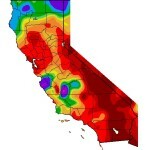 Other than a few, small area of precipitation in the north, California received effectively no precipitation this week. California snowpack is currently at about 19% of the April 1st average, down from 30% last week. According to the US Drought Monitor, much of the snowmelt was a result of abnormally high temperatures in the west, with California temperatures 9-12 degrees Fahrenheit above normal. 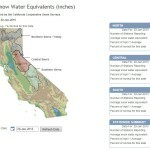 Some areas lost half of the snow water equivalence in a single week. This is an extremely rapid drop and indicative of the rate at which the current drought will worsen in the coming dry months. Statewide, California reservoirs are still at about 49% of total capacity and about 66% of the historical average. This Department of Water Resources graphic shows the levels of most of the state’s largest reservoirs’ levels as a percent of capacity and historical average. 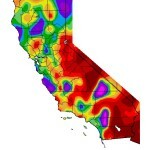 California soil moisture has not changed much in the past week, with particularly dry areas in Northern California and the Los Angeles area. 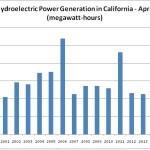 April 10, 2014, Oakland, Calif. – On April 8, the Department of Natural Resources reported that snow water content in the Sierras was about 32% of normal, up from 19% as measured on January 3rd, the first survey of the year. This is effectively unchanged from the April 1stmeasurement, which is the most comprehensive survey of the year and is an important indication of future conditions as snowpack is generally at its peak before the spring melt begins. 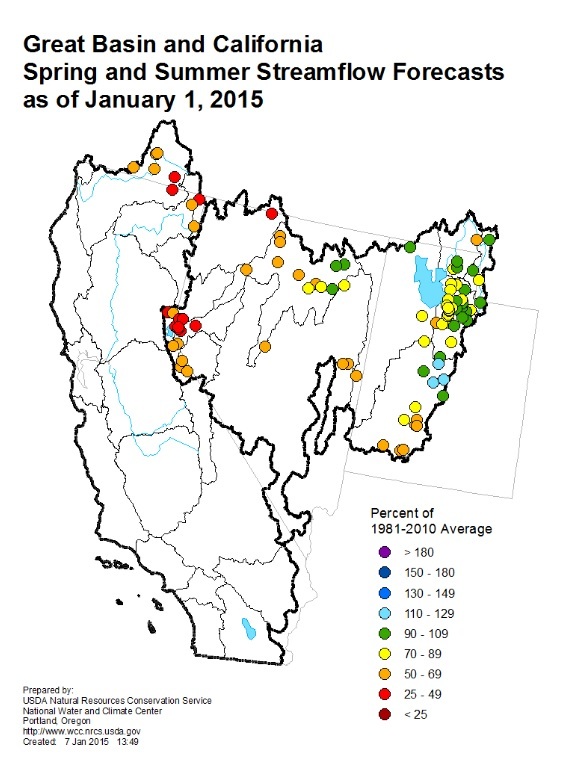 Snowpack provides about 1/3 of the state’s water supply. Current weather forecasts do not show any appreciable precipitation in the next week or so, indicating that the state may be at the end of the rainy season. Below is the April 9th update of the key information and graphics on the status of the current drought. Much of this information can be found at our California Drought website: www.californiadrought.org. 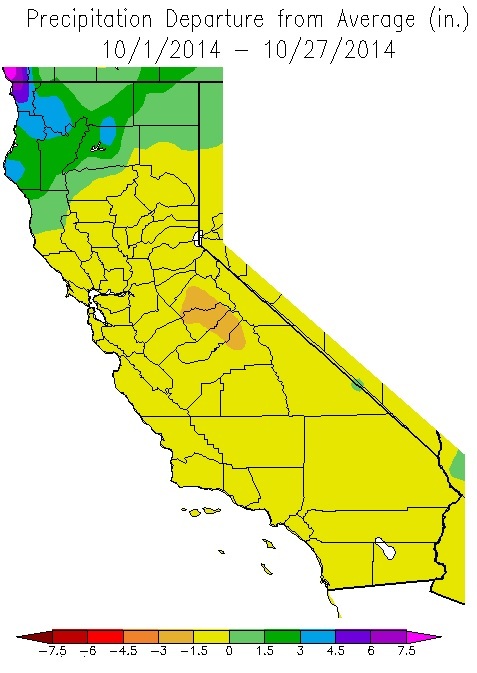 Very little has changed this week in California drought conditions. 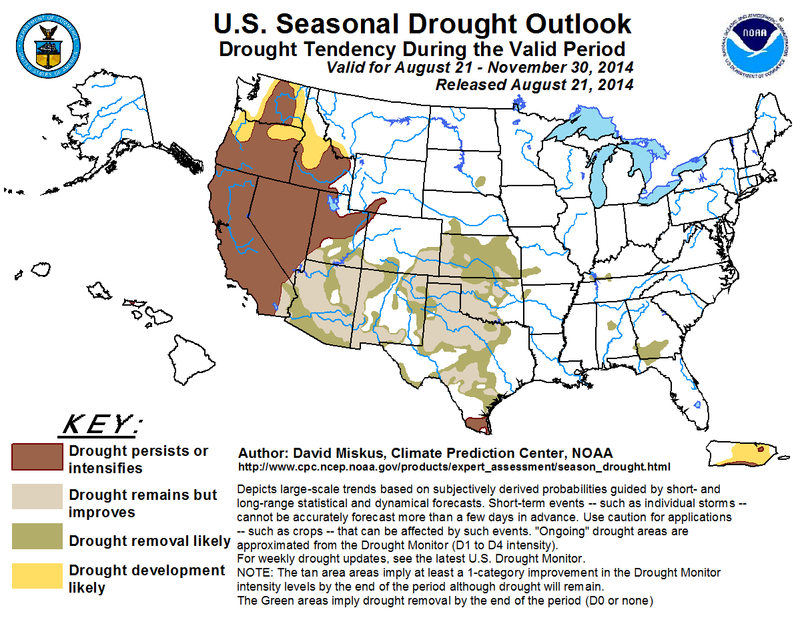 The entire state remains in abnormally dry conditions, with 69% of the state in extreme or exceptional drought. 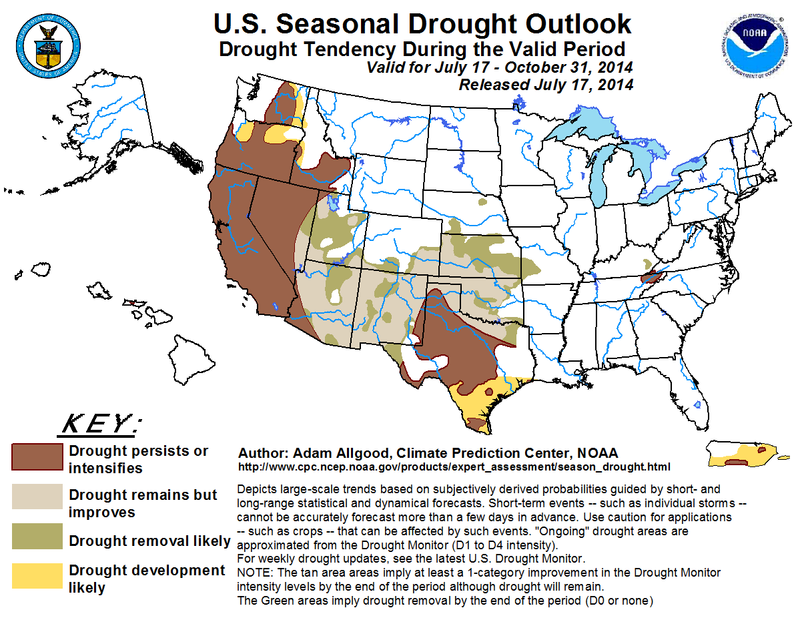 For a description of these terms, check out the US Drought Monitor’s website. 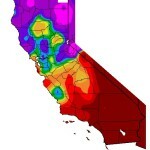 Precipitation in California remains low. 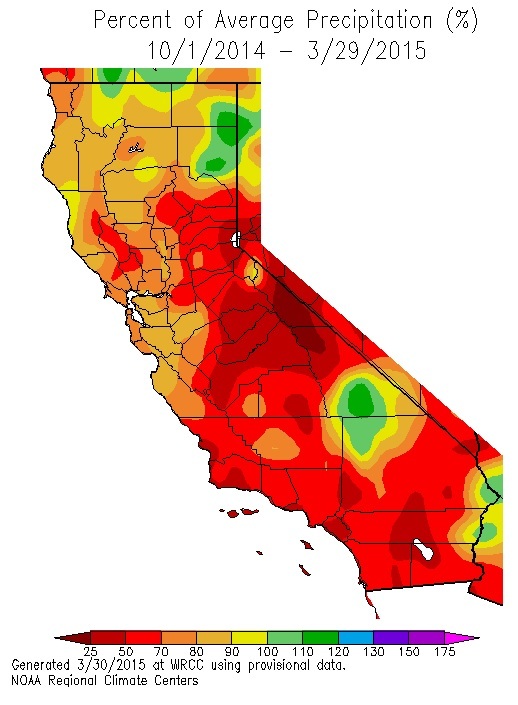 This map from NOAA’s Climate Data Center shows the precipitation deficit since the start of California’s water year on October 1st through April 8th. 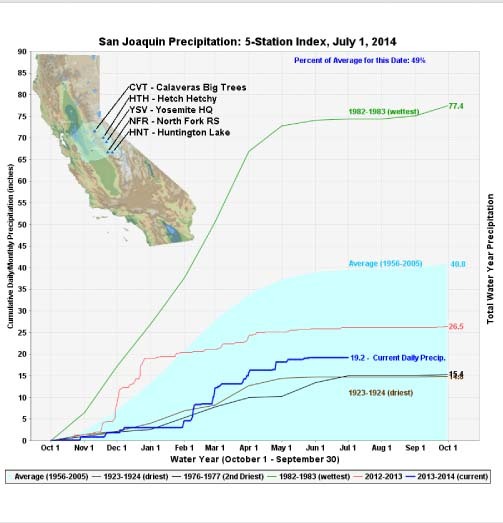 This week did see some precipitation, mainly in the North Coast, Sacramento Valley, and San Joaquin Valley regions. 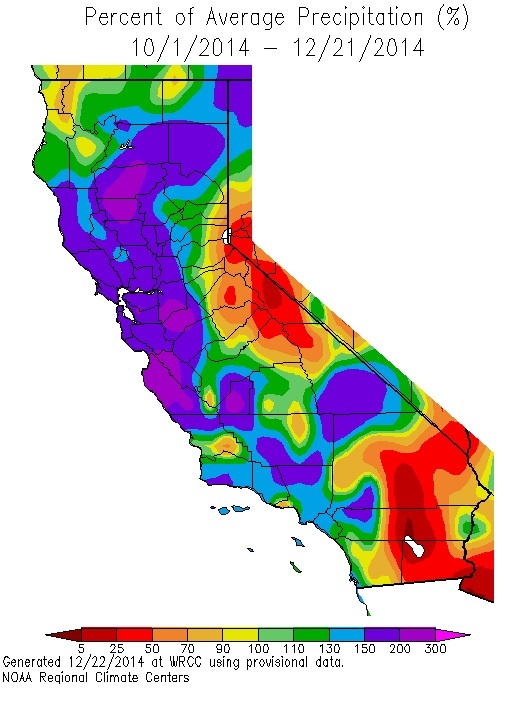 California snowpack is currently at about 30% of the April 1st average. 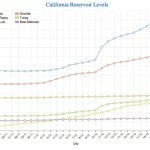 Statewide, California reservoirs are at about 48% of total capacity and about 66% of their historical average. 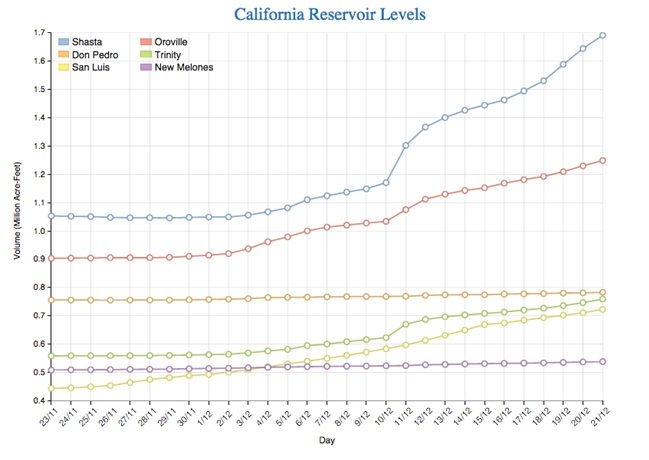 This Department of Water Resources graphic shows that levels of most of the state’s largest reservoirs levels are currently between 40% and 74% of their historical average. 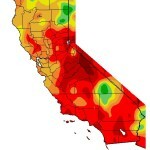 As measured by NASA’s GRACE satellite system, California soil moisture remains low, with particularly low areas in Northern California and the Los Angeles area. 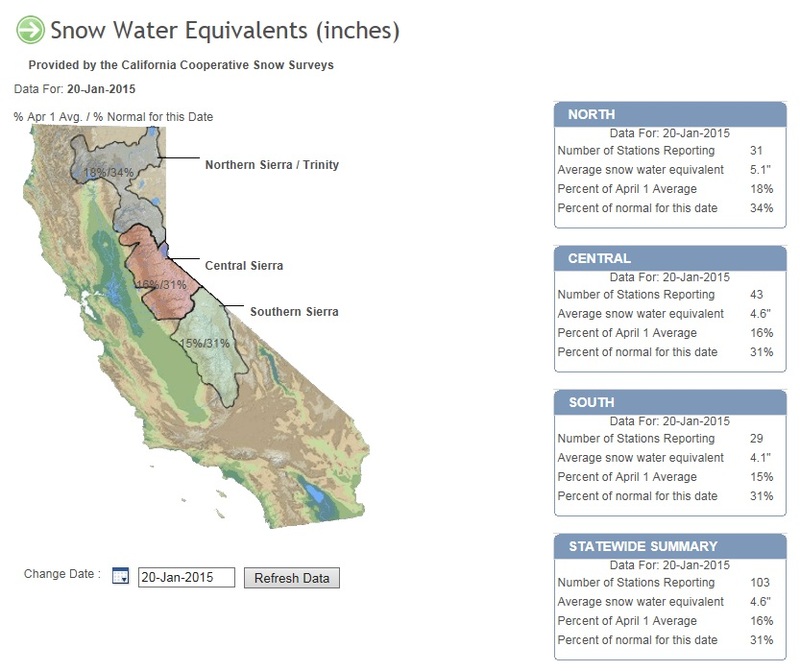 The end of the rainy season in California is arriving in a few weeks, and the April 1st snowpack measurement, which is a key indicator of water conditions, is tomorrow. As we approach the dry spring and summer months, the scope and severity of California’s drought will become more apparent, but it is already clear that California is faced with extraordinarily dry conditions, with impacts to all sectors and every corner of the state. As part of the Pacific Institute’s Drought Response efforts, here is the March 31st update of the key information and graphics that characterize the current drought. Much of this information can be found, regularly updated, at the California Drought website: www.californiadrought.org. A key component of California’s water supply system is the winter storage of snowpack and its slow release during spring and summer months. 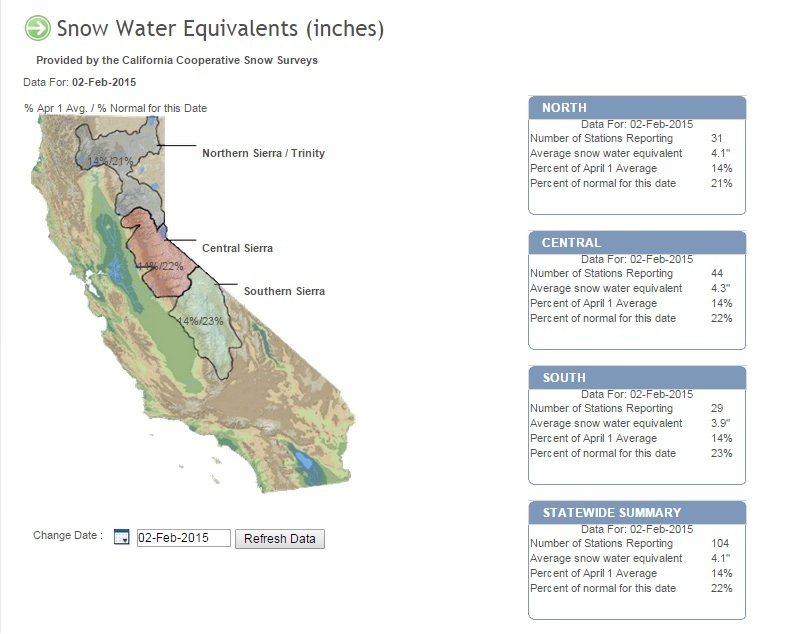 Rains in the past week have slightly boosted snowpack, but as of March 30, the Sierra Nevada current snowpack remains near record lows and the water storage is only 29% of normal. A measure of drought of special importance for agriculture is the amount of moisture held in soils. 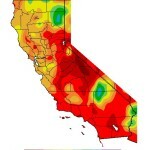 As estimated by the GRACE satellite system operated by NASA, California soil moisture is extremely low (as of March 24). 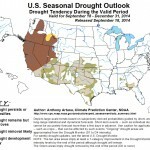 This will have serious consequences for farmers planning 2014 production. 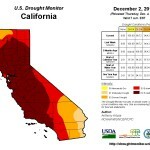 For more information, visit the California Drought website at www.californiadrought.org.